Chuck here. I realize I have been derelict in blogging my experiences of late, but I have never been this busy in my working life. Keeps me off the streets and out of trouble, but also keeps me from communicating with you. As a matter of fact, I’m just back from Sunday prepping for Monday, so don’t have a lot of time now, either. Bonnie will carry on in a paragraph or two. Nothing new to report on scholastic experiences. 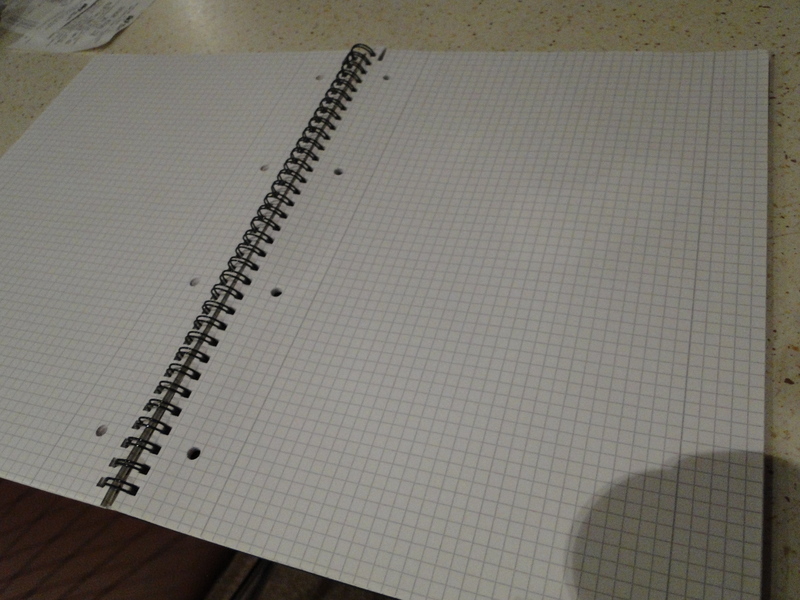 My big concern is the level of writing. That can’t be quickly fixed, and unfortunately poorly written work takes much longer to grade than better written, irrespective of content. More time lost! I always show my econ students how the power of compound interest and astute investments can make their golden years golden. Three or four approached me about learning more. So, I said sure, but we couldn’t take any more time in class. Maybe a get-together in the Old town at the Fat Cat and they could buy me a red pop or two to show their appreciation. Something approaching thirty showed up last Monday night, so there goes the red pops. Not only couldn’t go downtown, but my classroom was too small – had to move to a small auditorium. At least the internet makes it a lot easier to demonstrate this stuff, so no prep required – just another couple hours in the classroom. 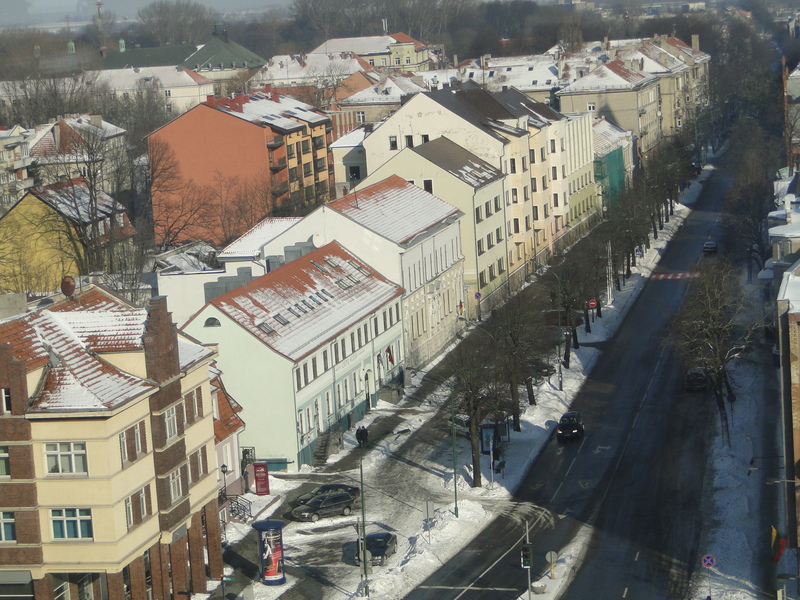 I had thought that the Klaipeda area was pretty safe. Last Sunday, in a fit of saying phooey on prepping, John and I decided to go up the coast a way and see the ice-laden Baltic crash against the coast. The pictures below show what happened. Surf’s up. Frozen, however. A cold, sleety snow was blowing in. No polar bears, but John told if the ice gave way and I fell in, I was on my own. Children are such ingrates! 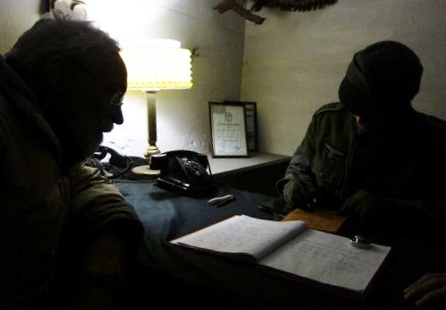 John mentioned someday we’d have to find abandoned German coastal defenses from WWII. Looks like we didn’t have to wait.. I’m taking the picture from an abandoned anti-aircraft position. Inside the one you’re looking at was considerable detritus dating after the late unpleasantness – I’d say the previous Saturday night, judging by the labels. Uh, Oh! Not quite so abandoned as I thought. This is my official SS interrogation (complete with guest book sign-in.) Not quite sure what to put down. "Nice dungeon you have here, sir. Is that a real machine gun?" Fortunately, the machine gun was a replica (they said). 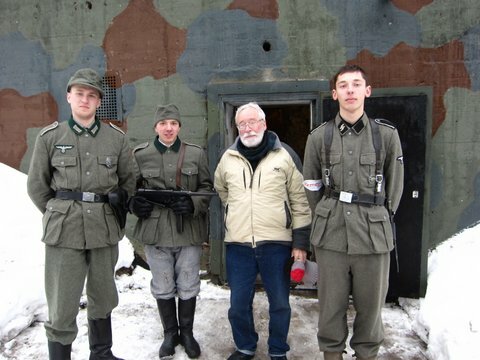 Not sure about re-enactors choosing the Wehrmacht. But, if you are Lithuanian, you have your choice of invaders, and I guess the Germans were the least bad – at least if you were Lithuanian. Anyway, ten litas sprung me after I easily (too easily) convinced them I knew nothing. On Friday evening, we had Algis and Lianna as dinner guests. I served what I thought would be representative of an American company meal for them–marinated flank steak, salad, twice-baked potatoes, a green bean casserole (I had to fry my own onions as they don’t sell those handy little cans of fried onions here) and apple crisp with ice cream for dessert. They were very curious about how I made everything and had seconds of the potatoes and green beans and Lianna asked for the recipe for the apple crisp. It made me wonder if they were just being polite but who knows? I realize because of our dining experiences here that people get accustomed to the tastes of their home and some other dishes can taste too different to be appreciated. They came bearing gifts–a bottle of wine–rated an 89 by Robert Parker himself– a beautifully decorated cake (shown below), and a nice coffee-table book about Lithuania. You can see these lovely-looking cakes in all the grocery stores. 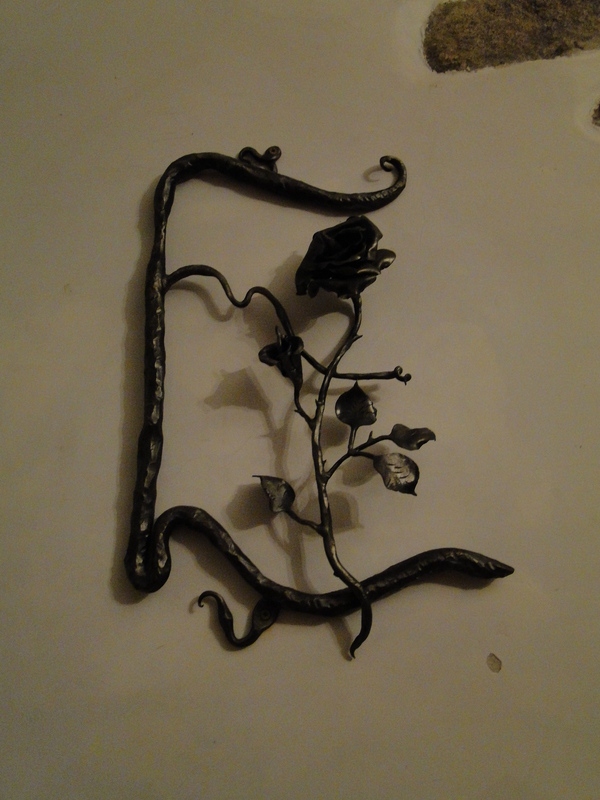 It is covered with a glaze and is very shiny which doesn't show up in the picture. They suggested we take it to our family meal with John & Rachel tonight so we have not yet tasted it. Algis and Lianna. Lianna is very attractive in person--this picture doesn't do her justice but is the only one I have. Once again we were picked up by Algis, this time with his daughter, Gabriella, for a Saturday adventure. He was embarrassed that two of the churches and a museum he wanted us to see were closed when we got there. However, we saw a couple of things and had an altogether enjoyable day. 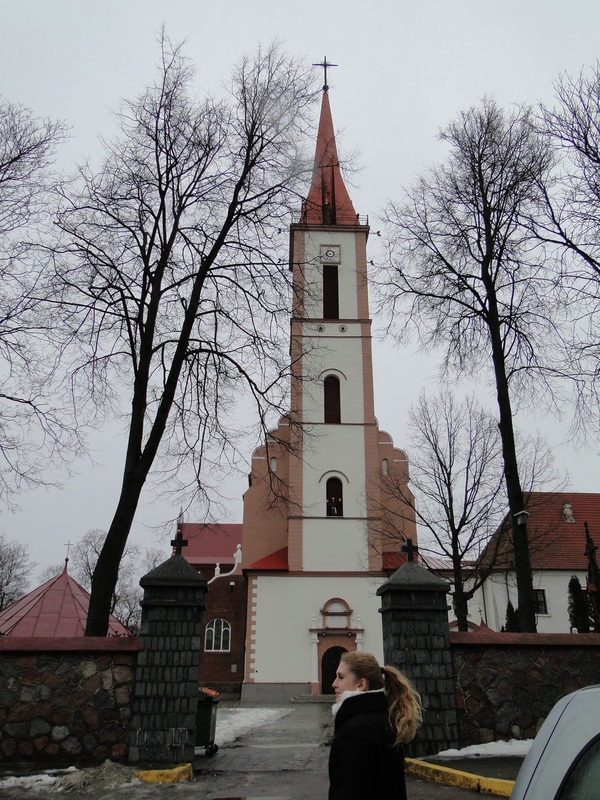 First we drove to Kretinga, just a few kilometers northeast and saw the Church of Annunciation of the Almighty God to Holy Virgin Mary (can you imagine answering the phone there?) 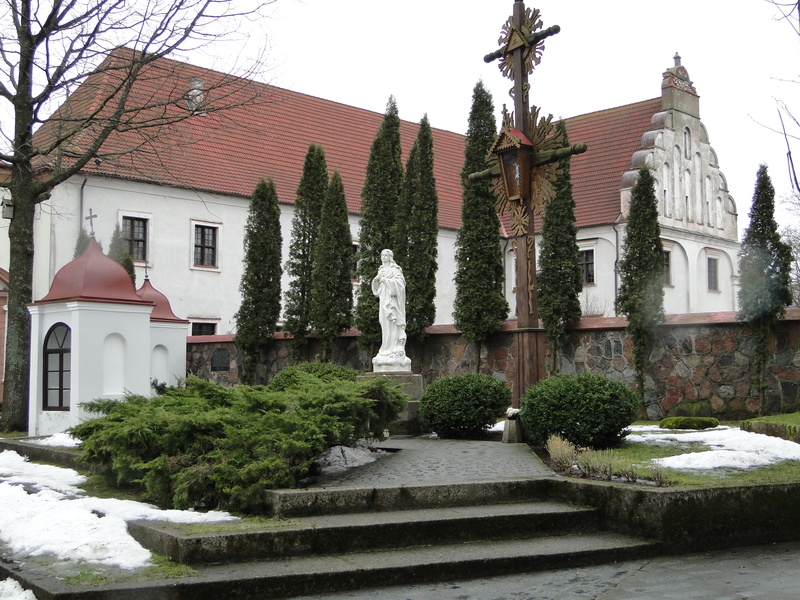 and the adjacent monastery. Of course, during the Soviet years, this was not in use but, thankfully, it was not destroyed and the monks returned in 1989. Above mentioned church, Girl is Gabriela. 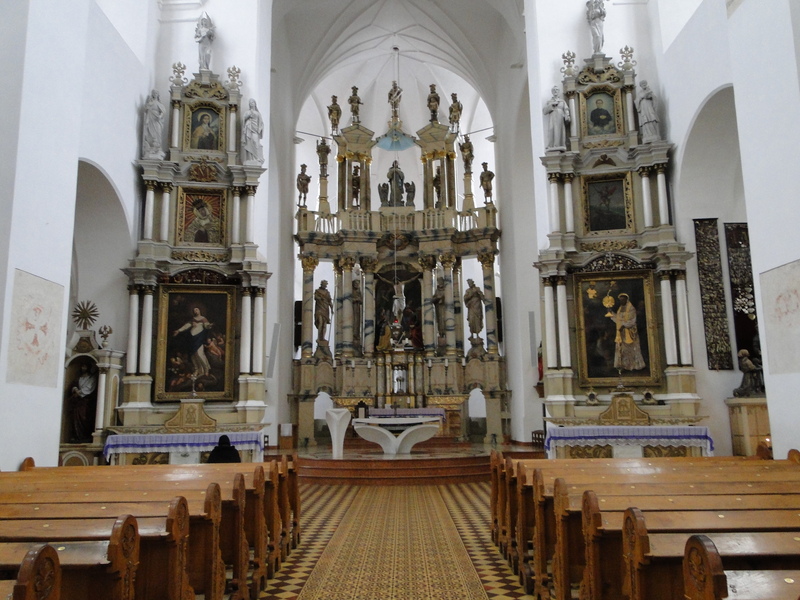 Inside church. The modern design of the altar and lectern seemed to clash with the rest of the church. 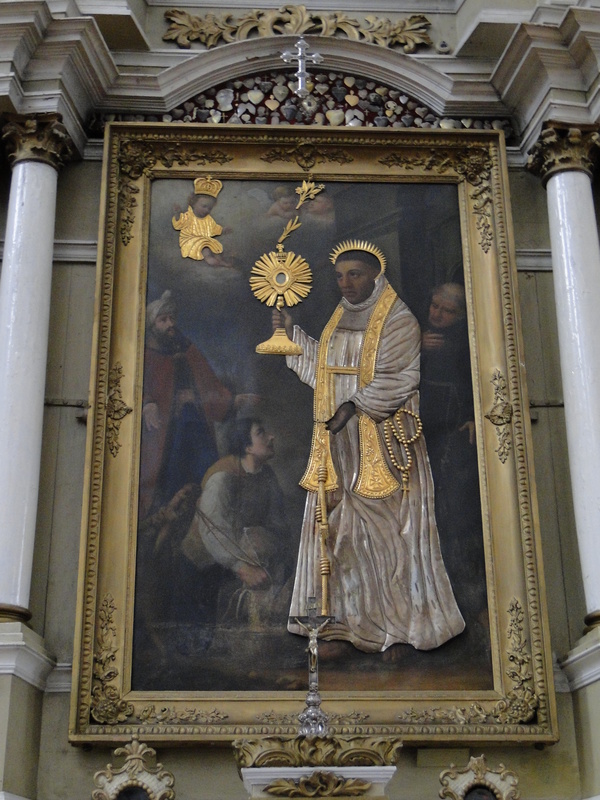 Painting of St. Anthony of Padua whose relics are buried here. 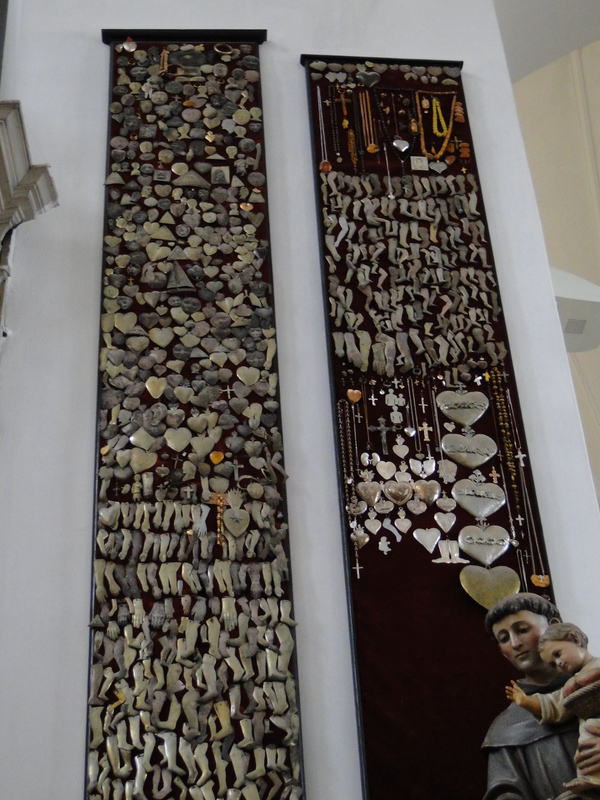 Replicas of body parts which were healed after prayers. We saw similar things in Ancient Corinth. 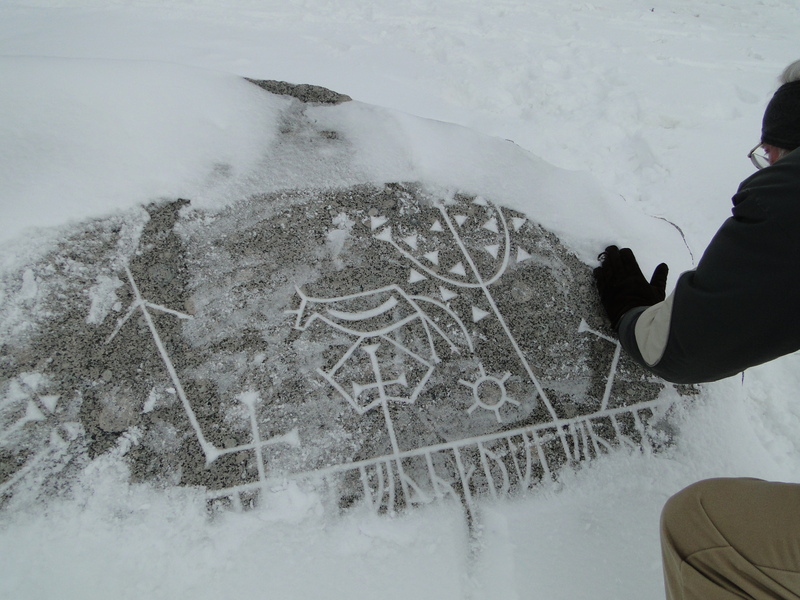 People would bring little sculpted feet and other parts to the temples to ask for healing. 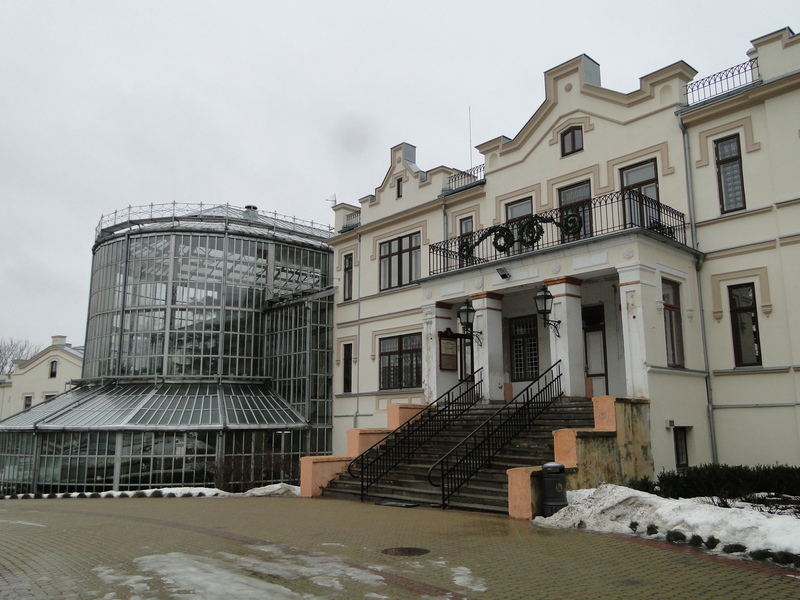 After the church, we visited the Kretinga Manor, an old mansion set in a lovely park (not so great at this time of year) and with a glassed in conservatory where we had tea and dessert. 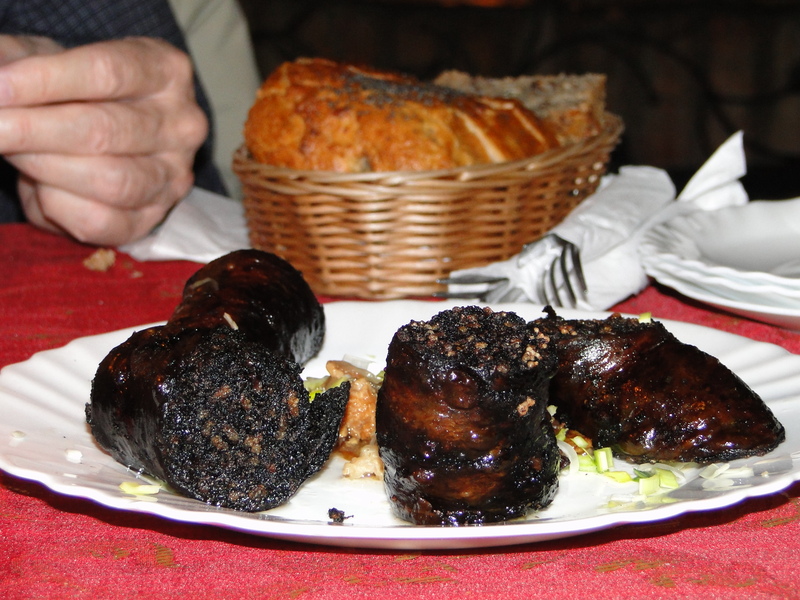 Another traditional Lithuanian treat--this is an appetizer and is meat ground up with rice--not bad. A second appetizer--boiled potatoes served with what amounts to pure, very rich butter with LOTS of garlic. You take a potato bite and a big slab of the butter together. Once again I am wondering how these people stay so skinny. I managed to eat a polite amount of this "heart attack on a plate." The meat for the main course was cooked on hot stones (look carefully to see meat) in this fire pit in the middle of the restaurant. 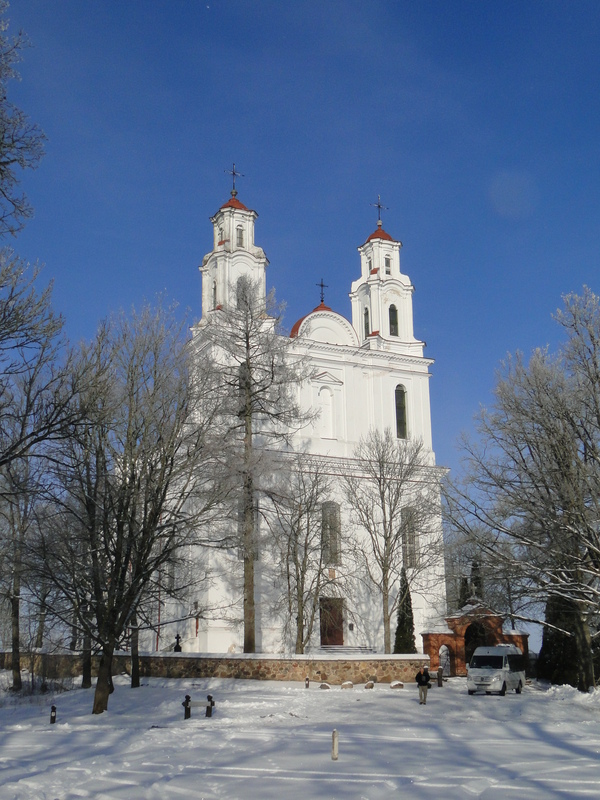 We are looking forward to next weekend: we will be travelling to Vilnius on the bus Friday evening and John and Rachel, along with the children, will drive over the next day for a couple of days. We’ll be staying at the same B&B near to all the sights in Old Town. 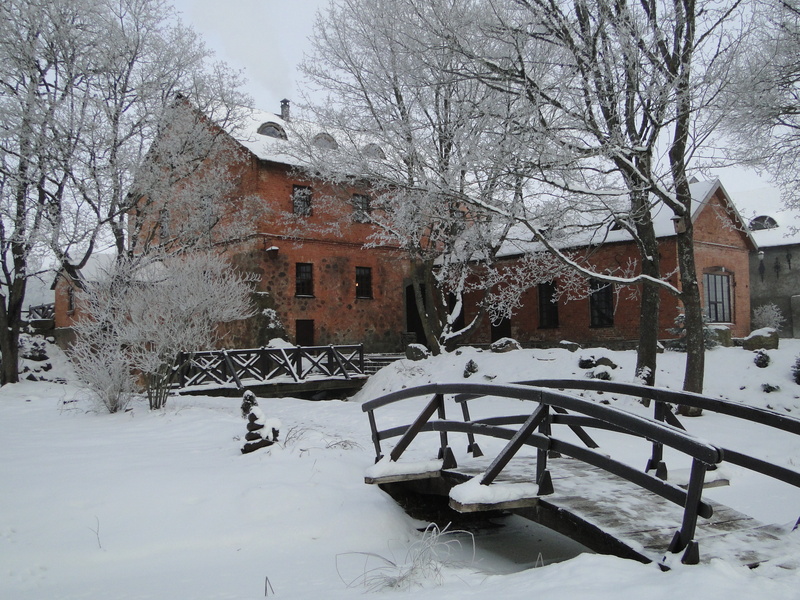 We are not sure what we’ll do the rest of the spring break week but hope to get to Riga, Latvia, as well. 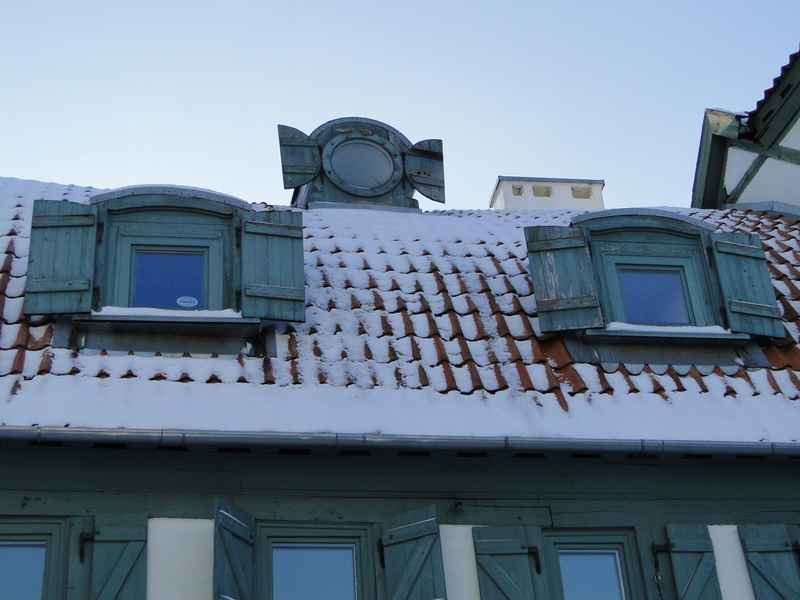 We have had to accept the fact that Tallin is just too far for the short time we have available. Chuck will need to be back by Saturday to grade all the midterms before Monday classes. I apologize to you all for missing out on a festival downtown yesterday and I know you would have enjoyed the pictures. However, Chuck and I walked up to the Catholic Church for Sunday service in the a.m. and after sitting in the cold church (although we got there early enough to sit under those hanging heaters) for nearly an hour and then walking home with the cold wind and sleet in our faces, the thought of going downtown and standing out in the weather some more was too much for me. So in furtherance of your knowledge of Lithuanian culture, I’ll tell you about what we all missed. 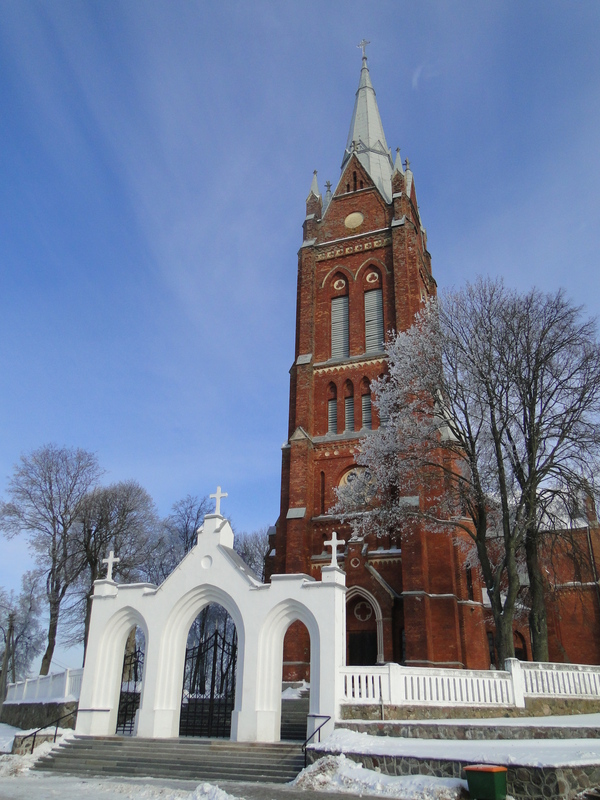 The celebration of Shrovetide, or Uzavenes here, takes place right before Lent. Townsfolk dress up in costumes of characters from folklore or as particular stereotypes. In the past it was popular to dress as members of minority groups such as Jews or Protestants (we have even heard tales of Jews being burned in effigy) but things are now more politically correct and the costumes might represent bribe-loving police etc. Scheduled entertainment includes a large straw effigy of a woman, symbolizing Winter, being burned and there is a fight between a large man who symbolizes spring and a puny one symbolizing winter. Spring always wins. Children love wearing masks of all sorts and I think they do go door to door some–sort of like Halloween. Pancakes are the food associated with the festival–just as they are in our own Shrove Tuesday celebration. This is one of those instances of a meld of pagan and religious celebrations. On Saturday, Algis took us on another outing. 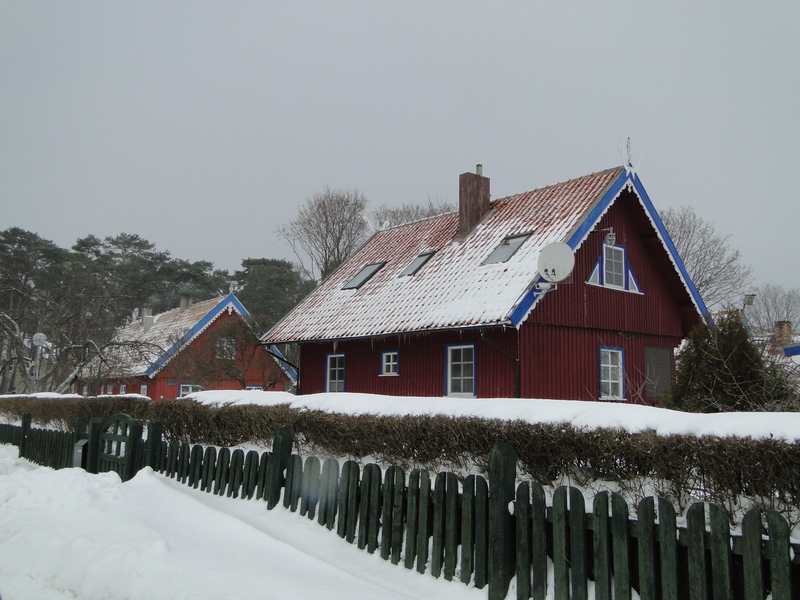 This time our destination was the Curonian Spit–a long (98 kilometers) peninsula from the border of Kaliningrad to Klaipeda ( very short ferry ride) which separates the Baltic Sea from the Curonian Lagoon. It is made up of sand dunes and a constant effort has been made since the 19th century to preserve it. 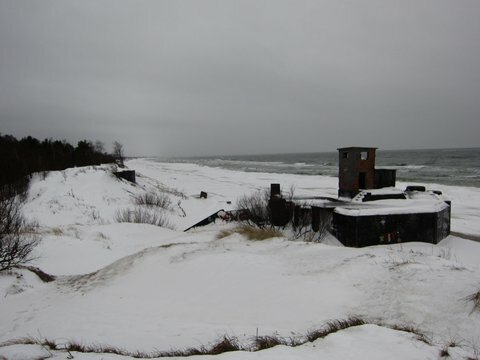 Before that, its forests were depleted for the large ship-building enterprise in Klaipeda and the blowing sand had obliterated the old fishing villages (maybe as many as 14 are buried there) and it was eroding into the sea. Now, much of it is once again covered with forests. Along the sea shores is a beautiful beach so it has been for many years a resort area. In the center is a strip of great dunes consisting of the dead dunes which are no longer blown out and the mobile dunes. It’s unique landscape has qualified it as a UNESCO World Heritage Site. 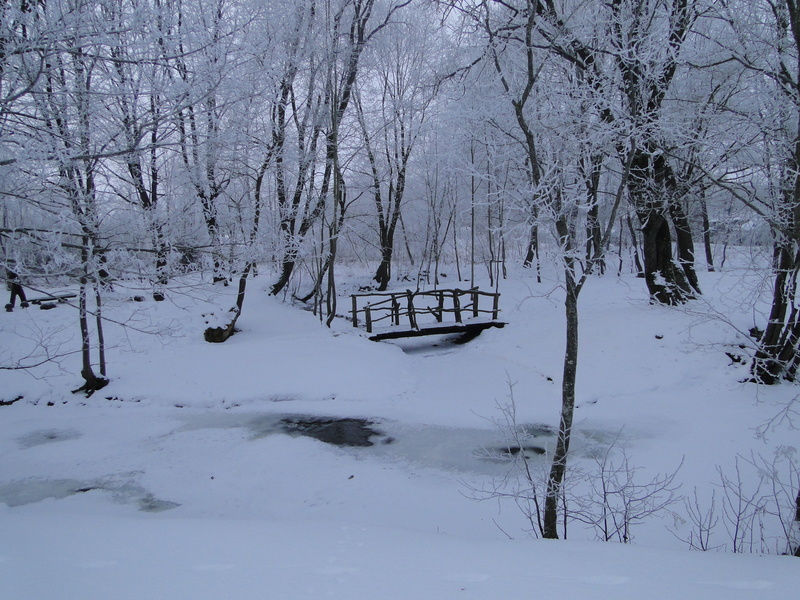 I think this will be a great place to return to when the snow has gone but as you can see below, it looked beautiful in the snow. 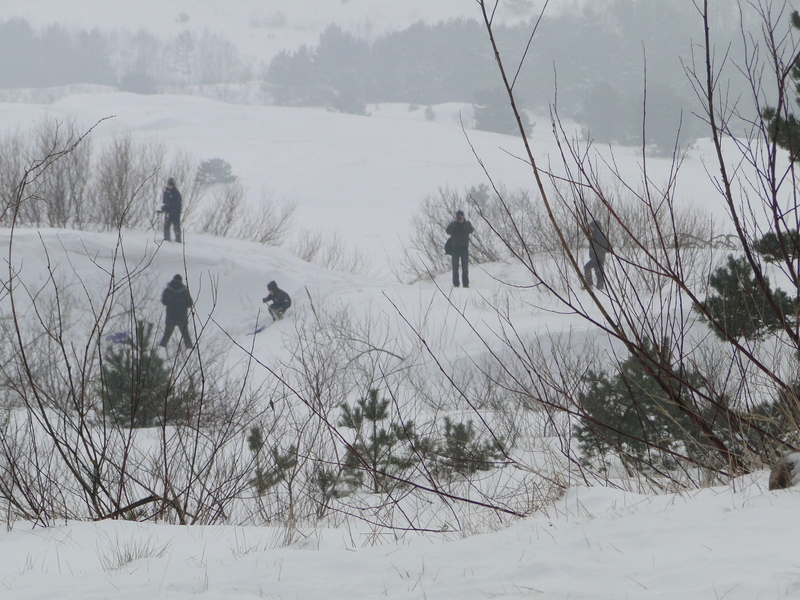 People enjoying the dunes--sledding etc. 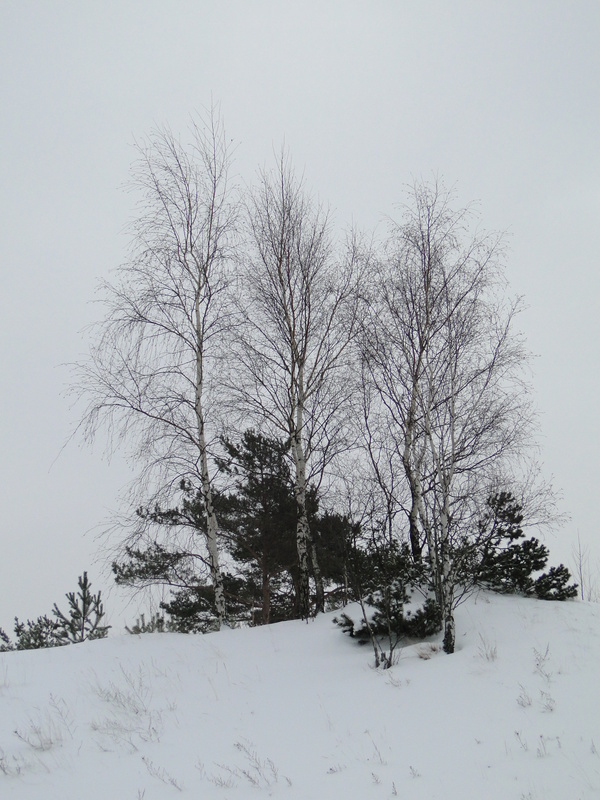 Two old folks climbing to the top of a dune. 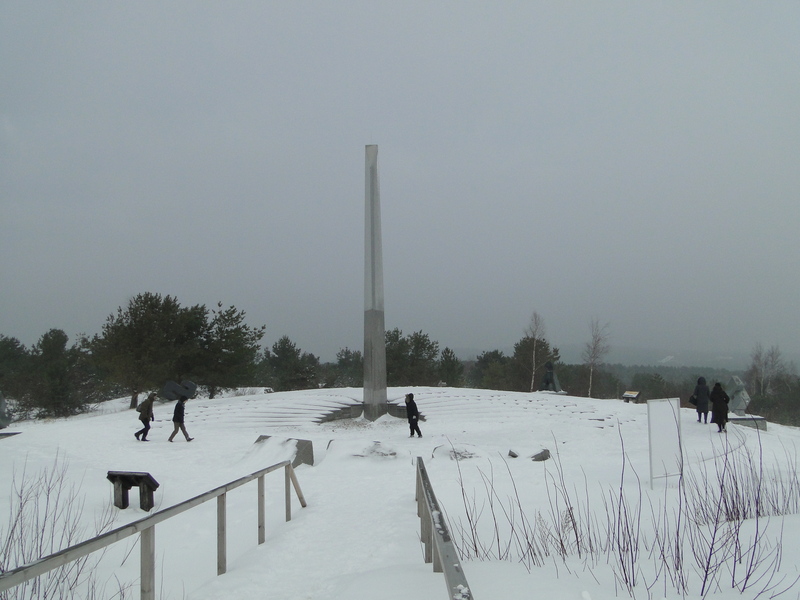 Large sundial at top of dune. That's me in the middle. 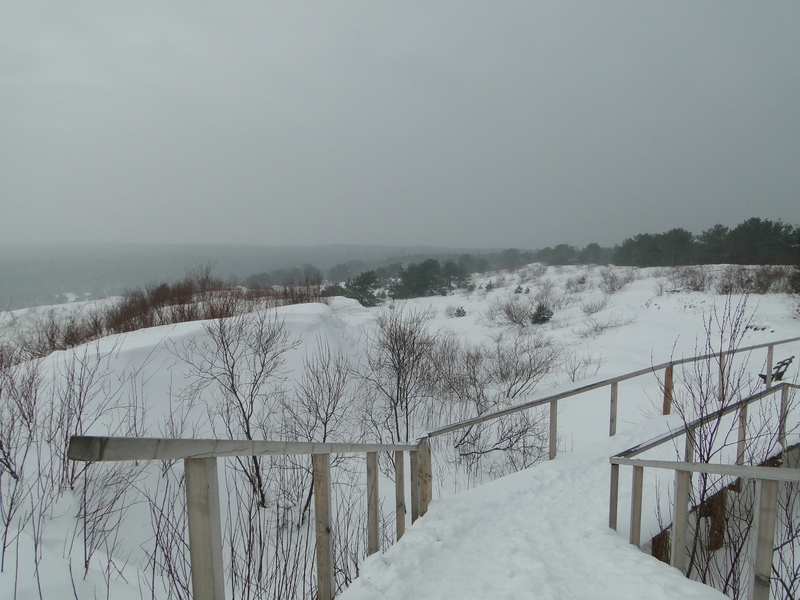 Boardwalks over the dunes–the Baltic Sea in the distance. 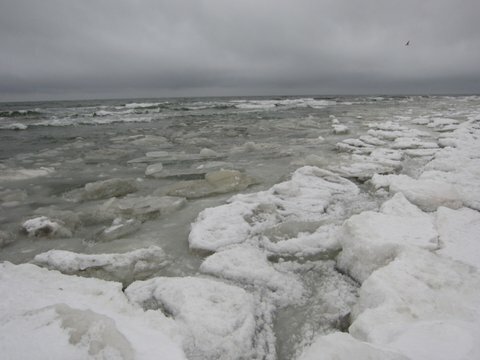 The Curonian Lagoon is frozen over but the Baltic, on the other side of the peninsula, is not. 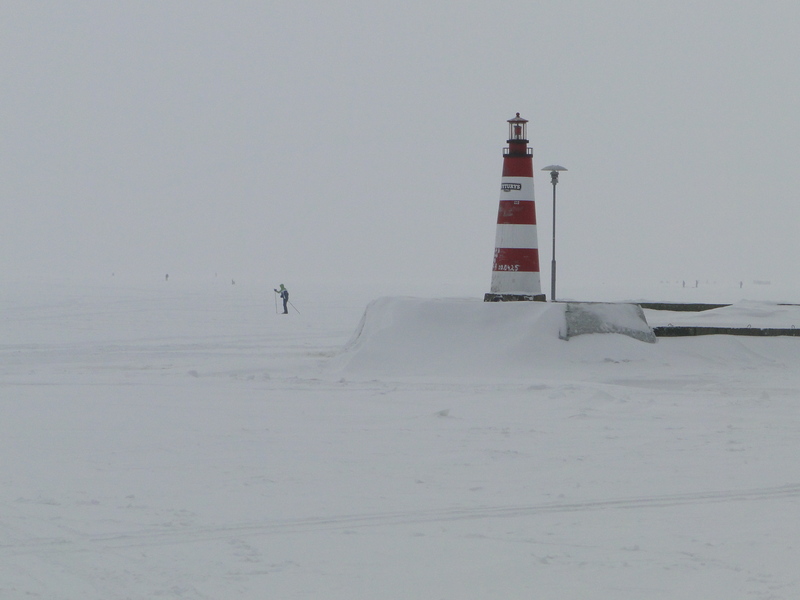 The picture at the top of the post shows people ice fishing out on the frozen lagoon. 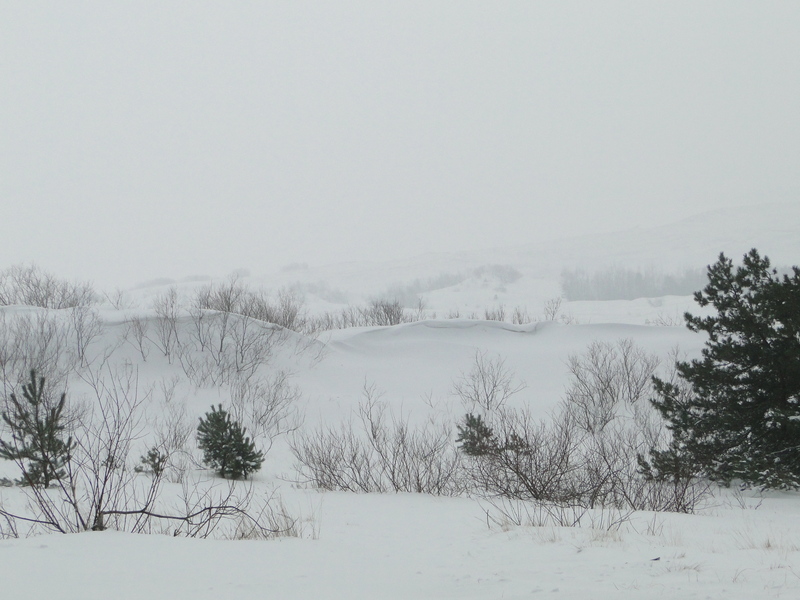 There was no visible horizon--just white on white. I couldn't see anything so it is just a point and shoot picture. 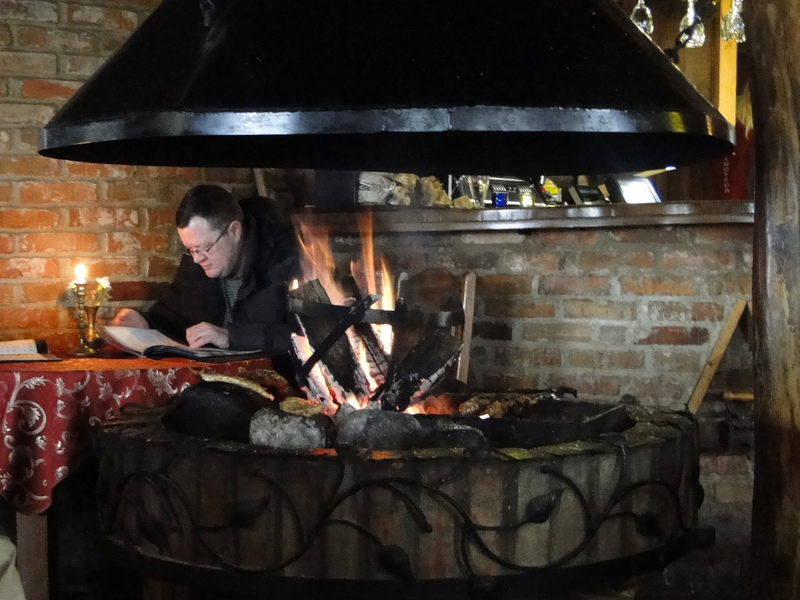 After we returned to Klaipeda, Algis took us to an authentic Lithuanian restaurant to try a traditional Lithuanian favorite, cepelinai, also known as Zeppelins for obvious reasons. 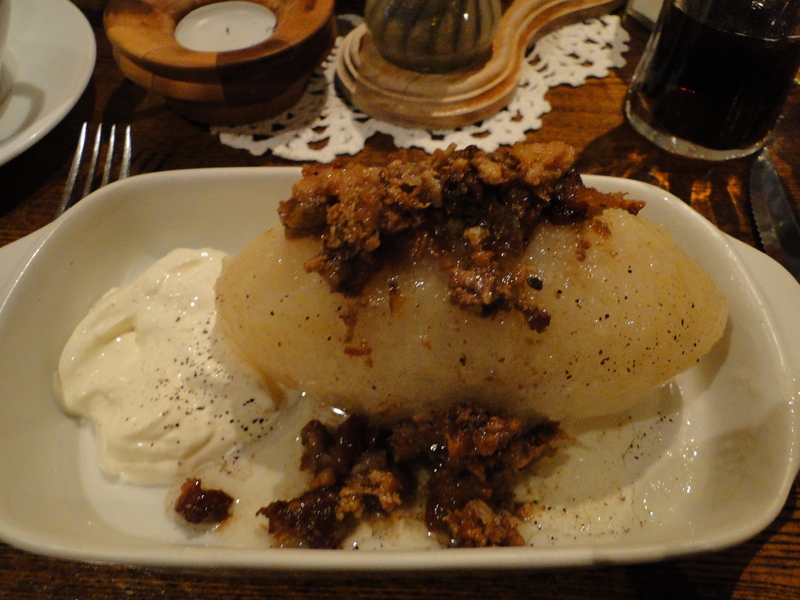 This is a large dumpling made from potato flour which is stuffed with ground pork and served with sour cream and a sauce of fried meat bits on top which looks like, but did not taste like, bacon. Algis said he can sometimes put away five of these at a sitting but Chuck and I struggled to get one of them down–they are big. Algis also urged me to try some herring soup which was cold and served with a small baked potato. I could not eat much of that so had to be impolite. Now I must bake some muffins for a “Mug and Muffin” event tonight–a discussion group for the women students, staff and faculty. I’m not sure whether I will attend but I’m happy to do the baking. I hope my baking efforts are more successful that they have been before–I haven’t discovered what is different yet–maybe the flour. This will be a busy week and I know Chuck will have some things to share–just as soon as he has time. 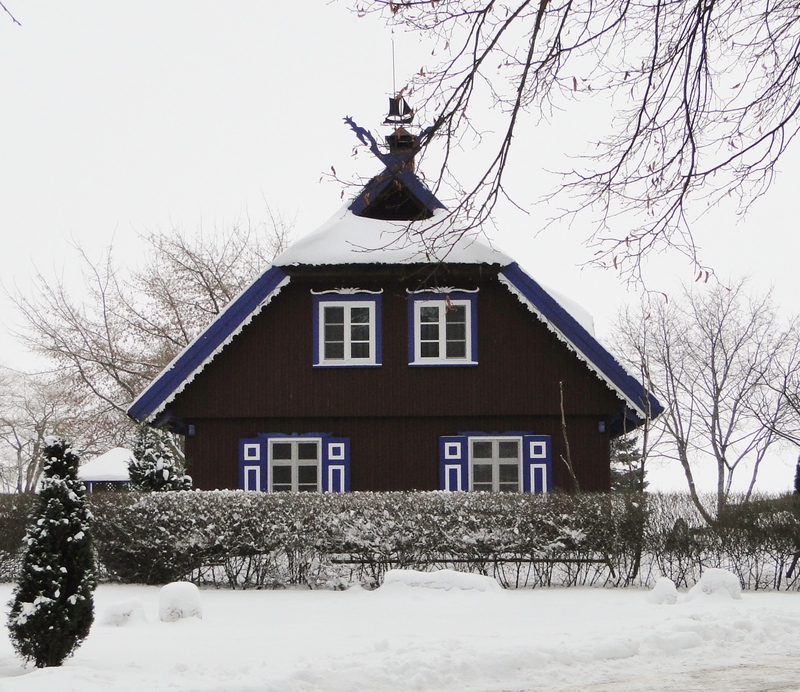 As it was in the balmy mid to upper twenties yesterday, we were able to spend some time out and about in Klaipeda taking more photos so, knowing we have things planned for this weekend, I thought I’d post another blog so there would not be so much at one time. As our Valentine’s Day evening out didn’t turn out so well–all the tables at the restaurant “XII” we had chosen were “reservated” so we settled on an inferior restaurant—and meal–close by. Being such a considerate husband, Chuck decided he needed to make it up to me somehow (even though I also got a lovely rose) so he actually took the afternoon off (he has no classes on Thursday) and took me back downtown for lunch at the “XII.” It was a most pleasant experience. 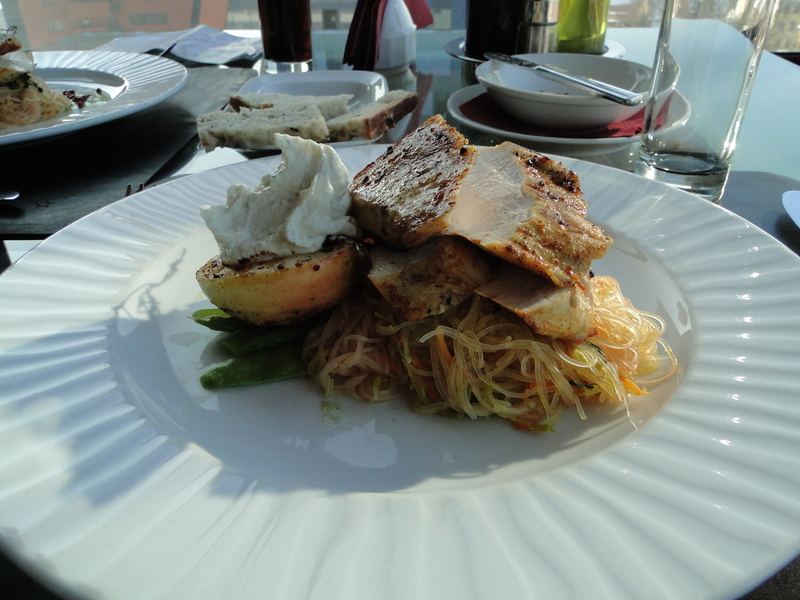 The restaurant is located on the 12th floor of the hotel Amberton, with windows all around to view the city as we ate. The daily luncheon special for only 15 lita ($6) was not available as it was a national holiday –Lithuanian Independence Day–but the cook and waitress both remembered we had been turned away on Tuesday night and said they’d make an exception for us. Then, in addition, they brought us a wonderful dessert to share for free. The lunch itself was just delicious–a real bargain for $6. Grilled chicken breast on very tasty noodles served with half a baked apple, cream sauce, snow peas and a hot pepper sauce. 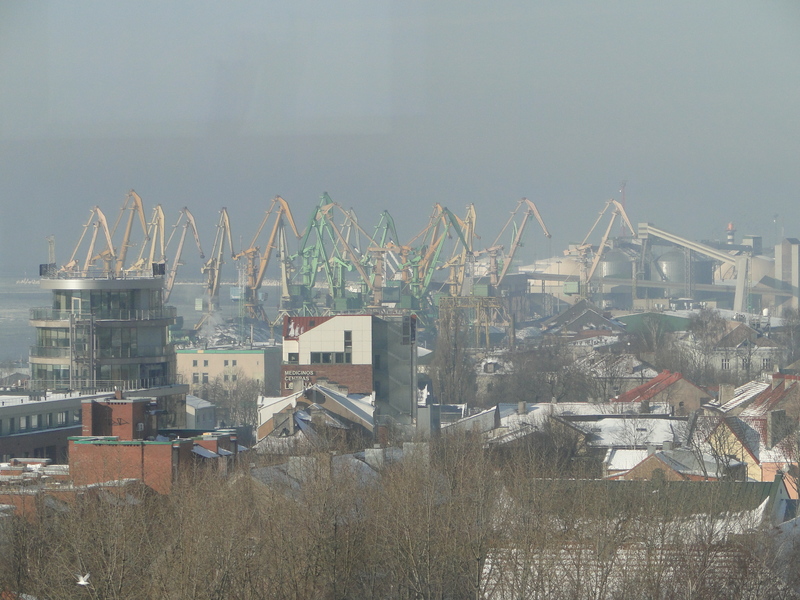 Klaipeda is Lithuania's only seaport and is very busy. We could view the loading cranes and ships entering the port as we ate. 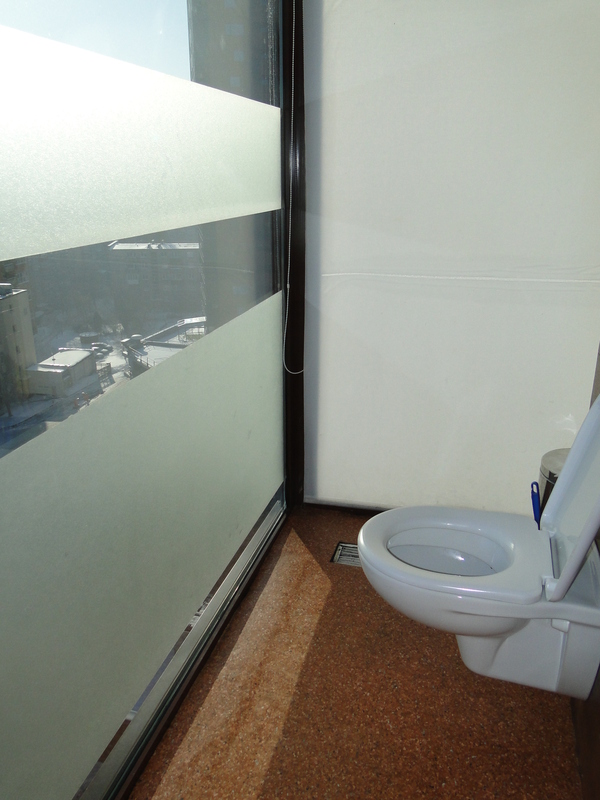 The restroom was interesting--like sitting in a window about 2 feet from a 12 floor drop--with strategically placed privacy glass--but still it made me uncomfortable. After lunch we joined others in a pleasant stroll around Old Town. We intended to visit the Blacksmith Museum: closed for the holiday! 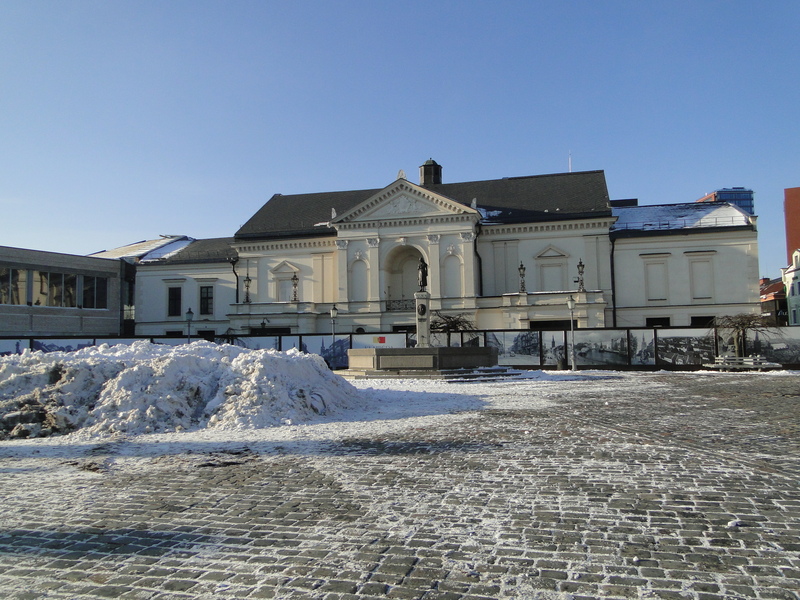 Also the “Museum of Minor Lithuanian History”, which is not, as you might suppose, Lithuanian trivia, but a reference to this part of the country. We visited a jewelry store selling only amber. I bought an inexpensive pendant but the prices went very high if one were wanting to buy a really special piece of jewelry. What was most interesting was the private collection of amber objects they had on their lower floor. 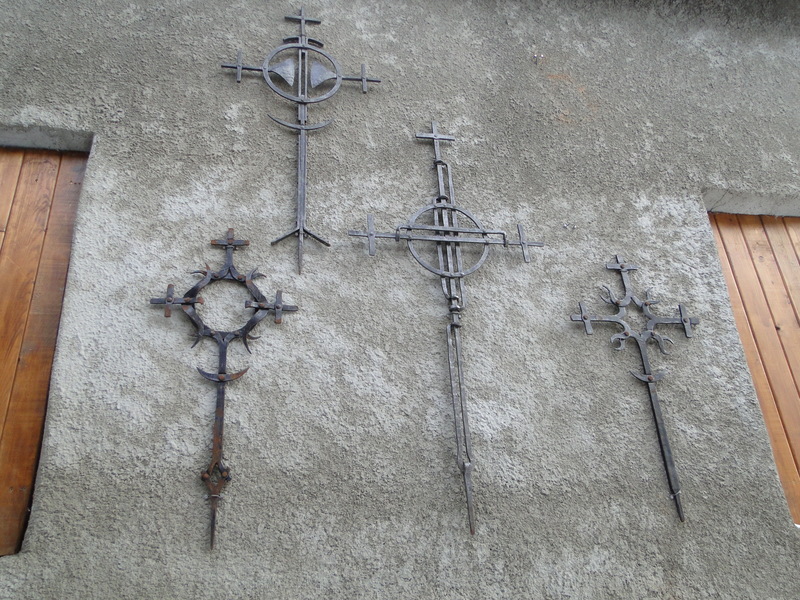 It was very frustrating I was not allowed to photograph these most interesting and unusual pieces. There was a large–maybe 3 x 4 feet– “picture” made of all different colors of amber carvings. It was “priceless” we were told, being made by the artist who had restored the amber room in the Catherine Palace in St. Petersburg. We had never seen anything like it anywhere and it was truly impressive. (Google –the Amber Room, Catherine Palace St. Petersburg and it gives you some idea of what this piece looked like.) 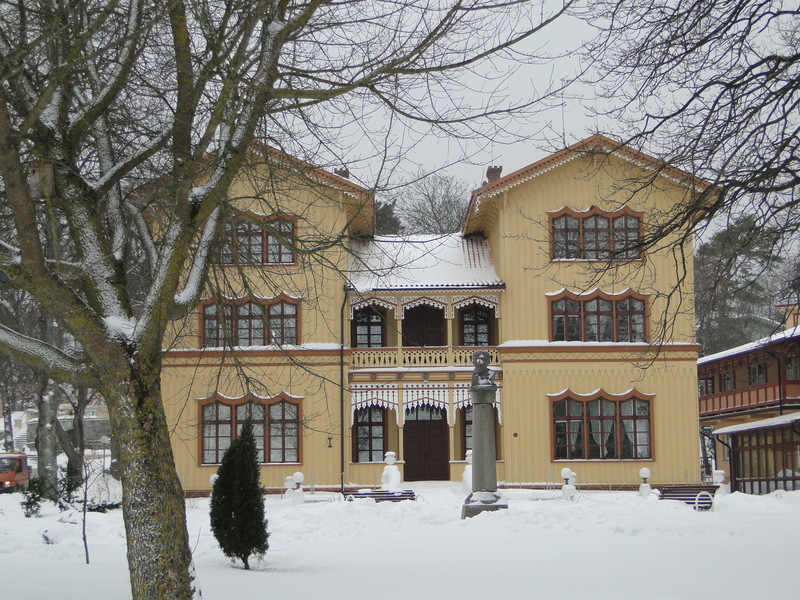 I was surprised it was not in the Amber Museum instead of in the basement of a jewelry store. 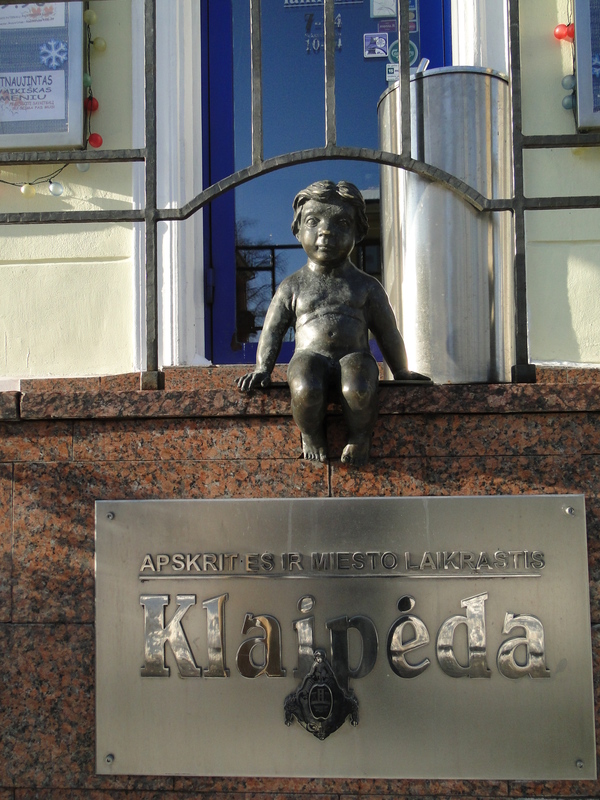 Anyway, it was a bit of serendipity because I had not seen it mentioned anywhere in the tourist literature about Klaipeda. 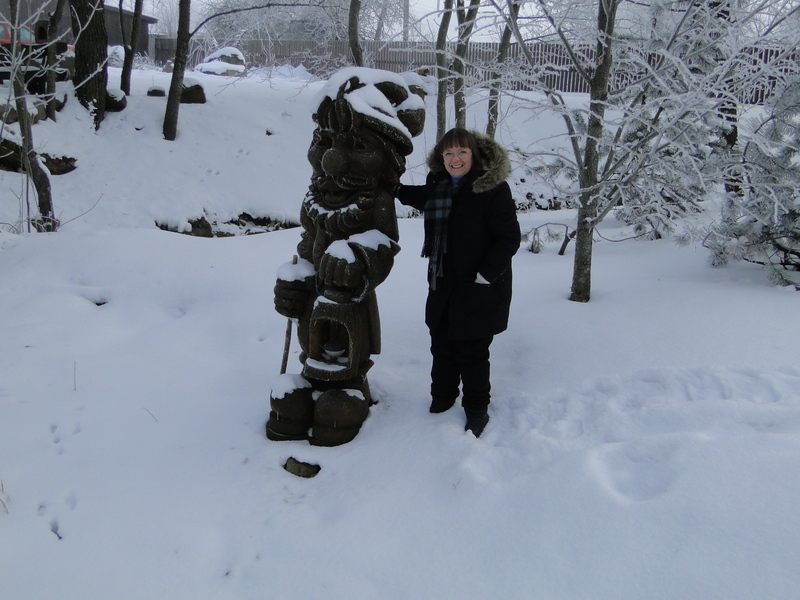 The two types of art I see over and over here are wood carvings–many carved into a tree trunk–and metal art. It is everywhere. 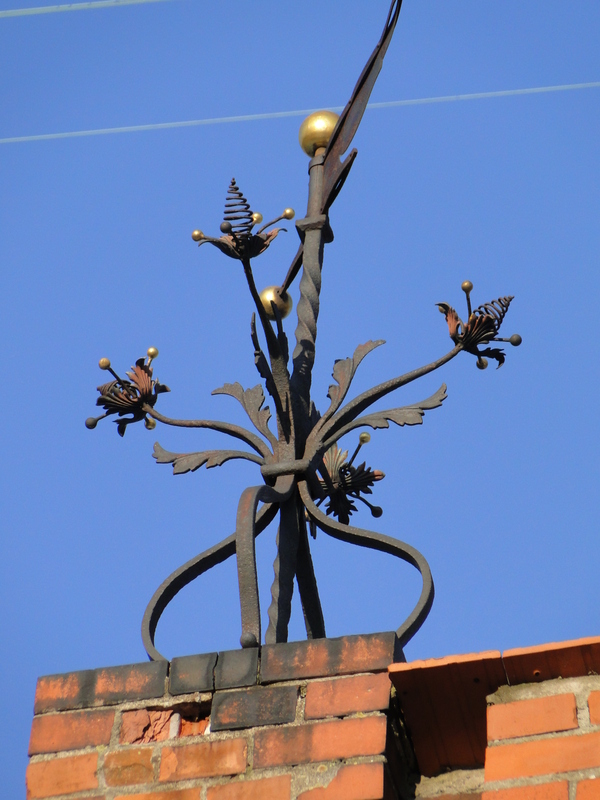 Here are some photos taken in Old town of some of the metal art and the fachwerk style of buldings built in the 18th century. 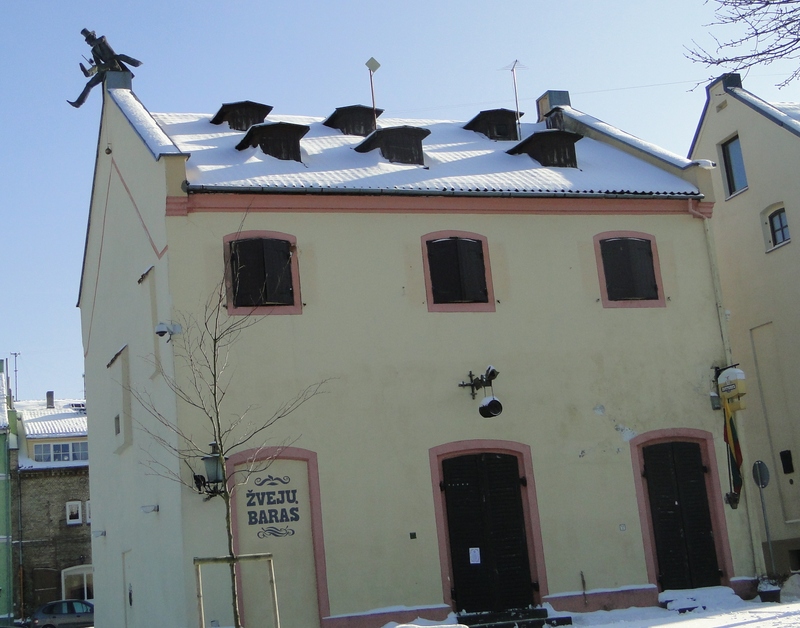 Notice the chimney sweep on top of this building. 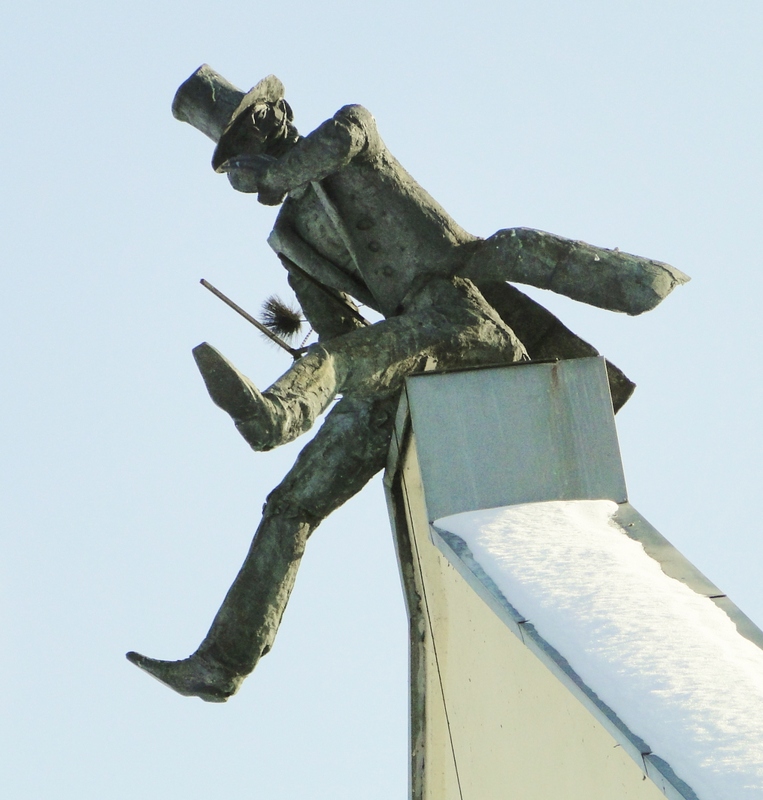 Note he is not on top of a chimney. We have no idea what he is doing. 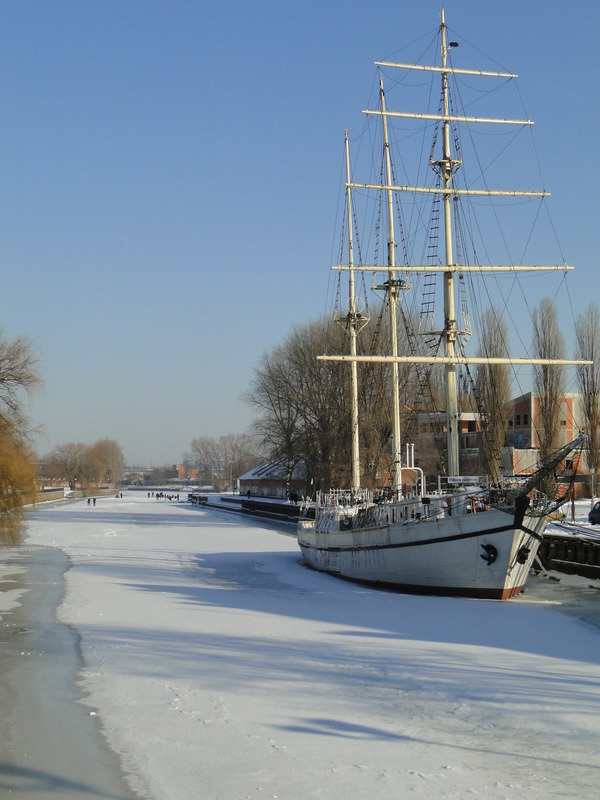 The frozen River Dane' and the Meridianas sailing vessel, built in 1948 and used by the Klaipeda Navigation School for training, Now it is just one of the sights of Klaipeda. Some of the old fachwerk-style buildings--now used for art studios and such. Theater Square --sometimes special events take place in this square complete with craft booths and touristy stuff. 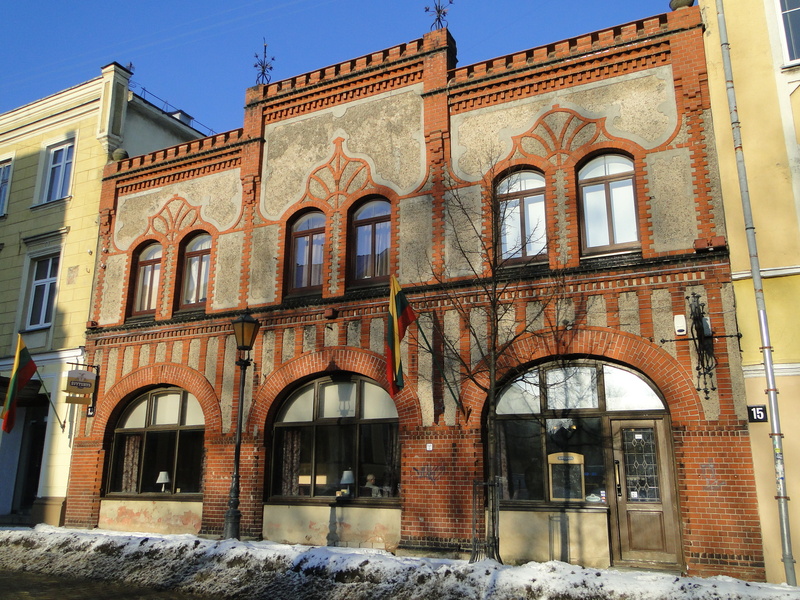 Hitler spoke from the balcony you see in March 1939 the day after Lithuania surrendered Klaipeda to Germany. The Germans called it Memel, and it had been part of East Prussia before WWI. Those of you who follow John’s blog already are aware of this –but for the rest of you I share this charming custom of Klaipeda’s brides and grooms. (It seems appropriate for the week of Valentine’s Day.) Before the wedding, the couple buys a padlock and on the day of the wedding, they attach their lock, with their names and the date inscribed, to the bridge and throw the key into the Dane’ river–symbolizing the permanence of their love for one another. 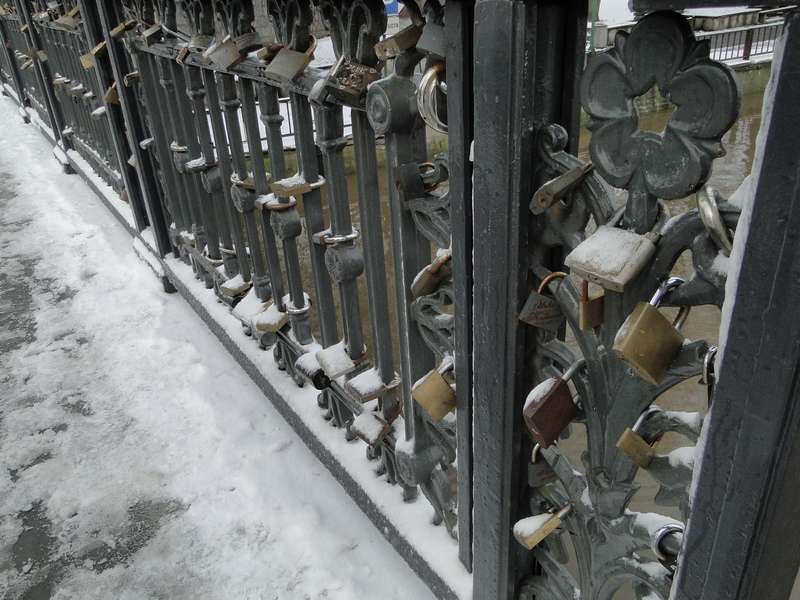 Eventually the bridge gets full of locks, then cut off by the city–kind of sad for some I am sure but, given there is a high divorce rate here as in the U.S., there are probably several couples who can’t wait until their locks have been removed. 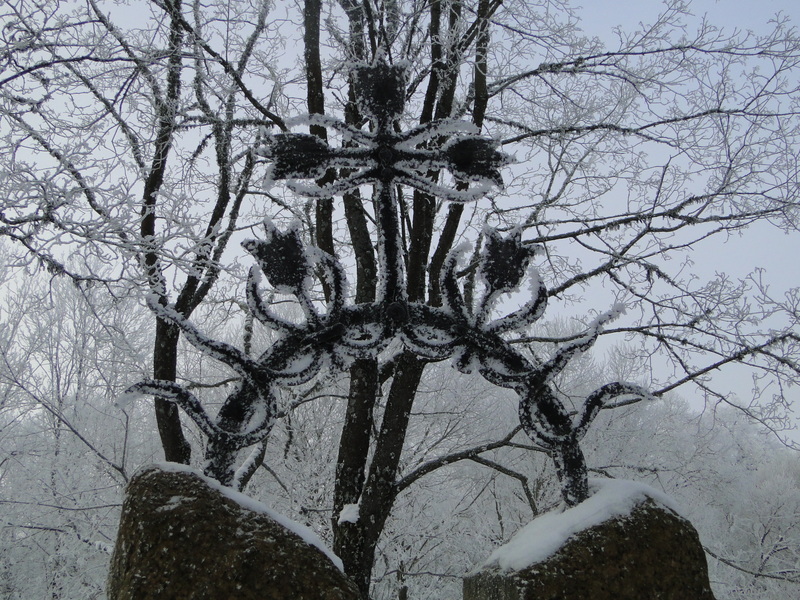 Mindaugas, the name of the first king of Lithuania (crowned in 1253) is a popular name here. 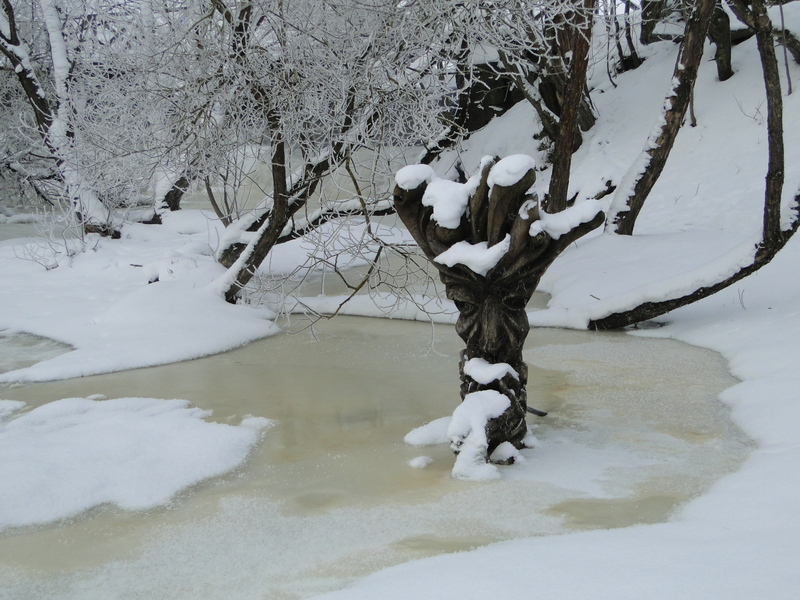 I actually took this particular photo a while ago–before the river froze. I managed to take about 100 pictures yesterday but I think this is about all you can take at once. 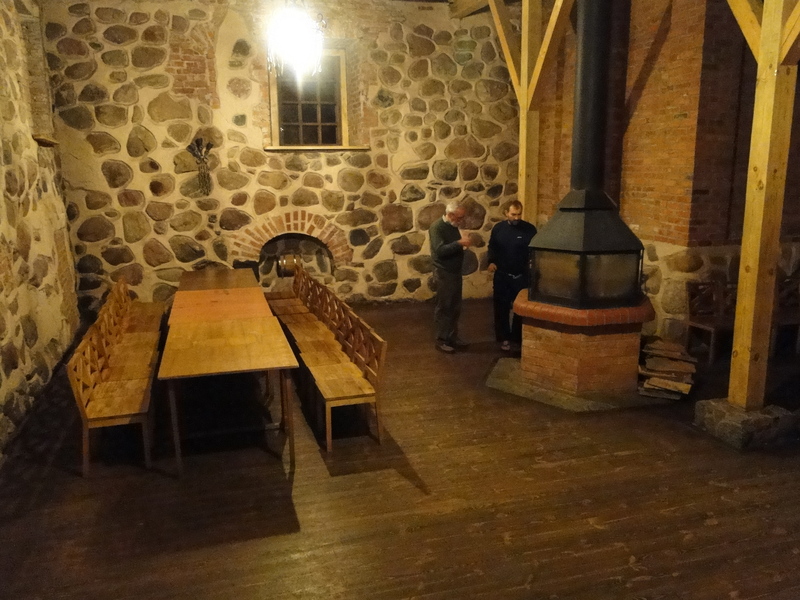 Friday evening we boarded a small bus with eight other faculty/faculty wives for an overnighter in the country about 100 miles or so from Klaipeda. 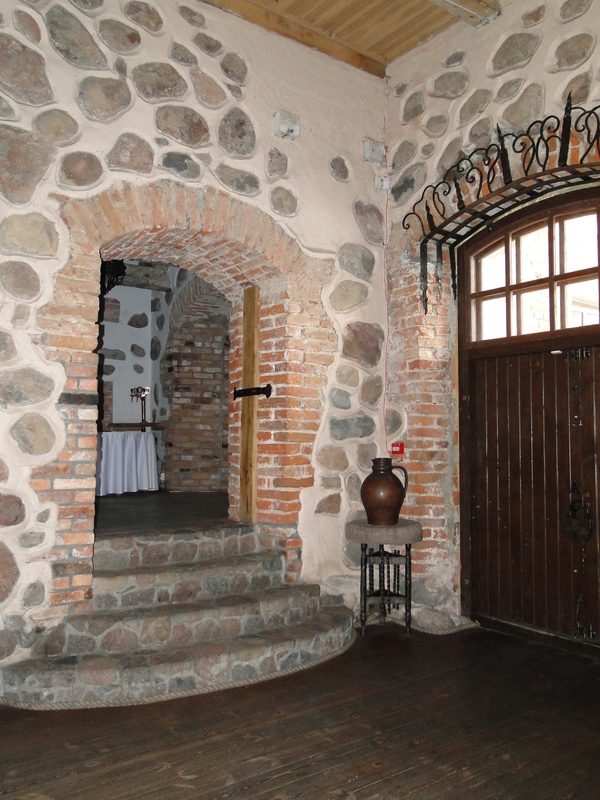 Our accommodations were unique–a country inn built inside the structure of an old, abandoned mill. It is owned by the family of two students, Justina and Gabriella, who also live in the mill–it is large enough to contain the family’s living quarters as well. 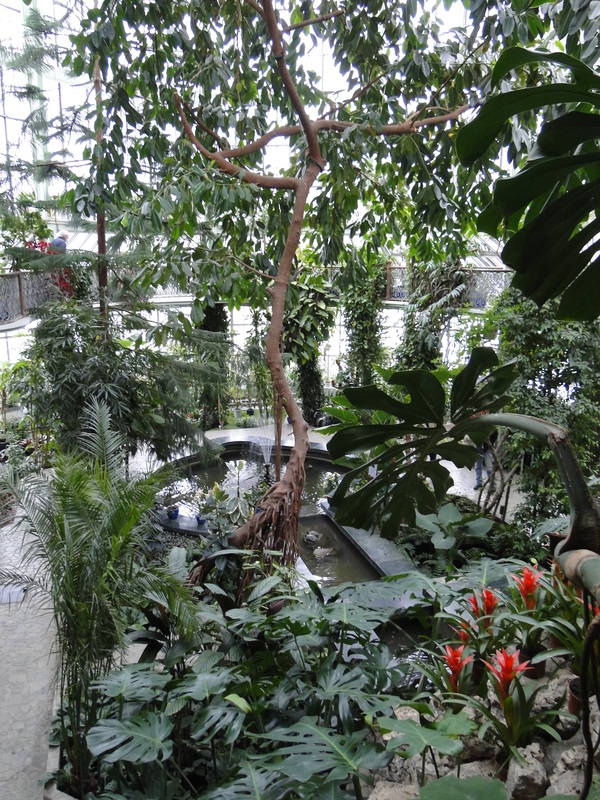 The place was totally charming and I took quite a few photos. At the risk of boring you, I am including several of them here. 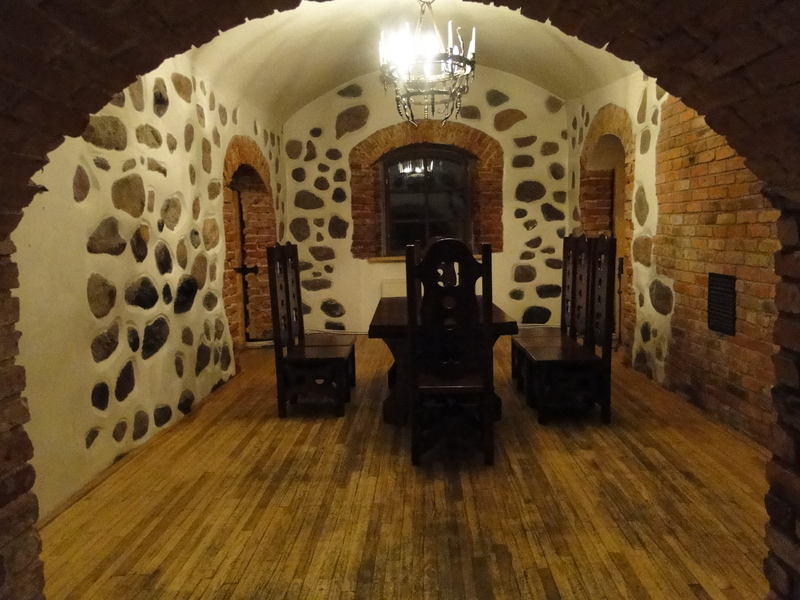 We sure wished that you could have been there with us and we do recommend it in case you’re ever travelling through Lithuania. 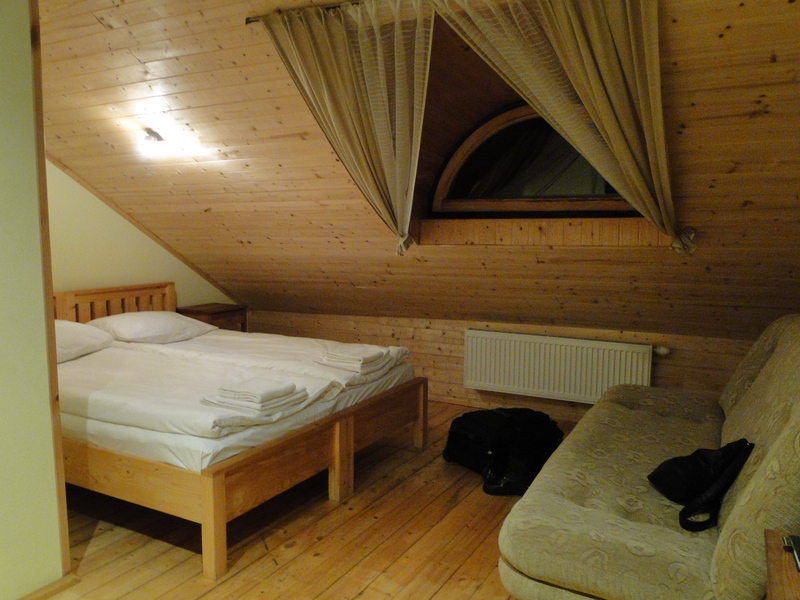 Our room--not fancy but nice. 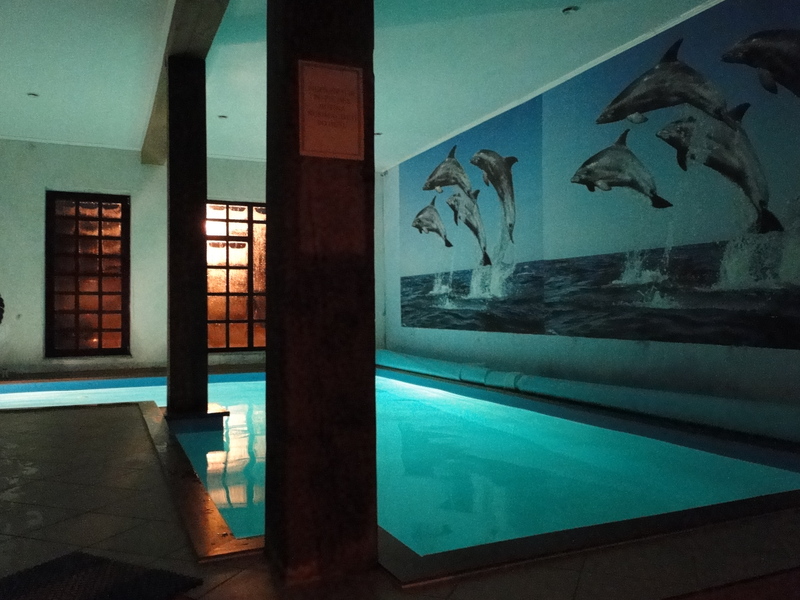 The pool---sauna on the bottom floor. The grounds were lovely and the owner had built little bridges over the mill stream. 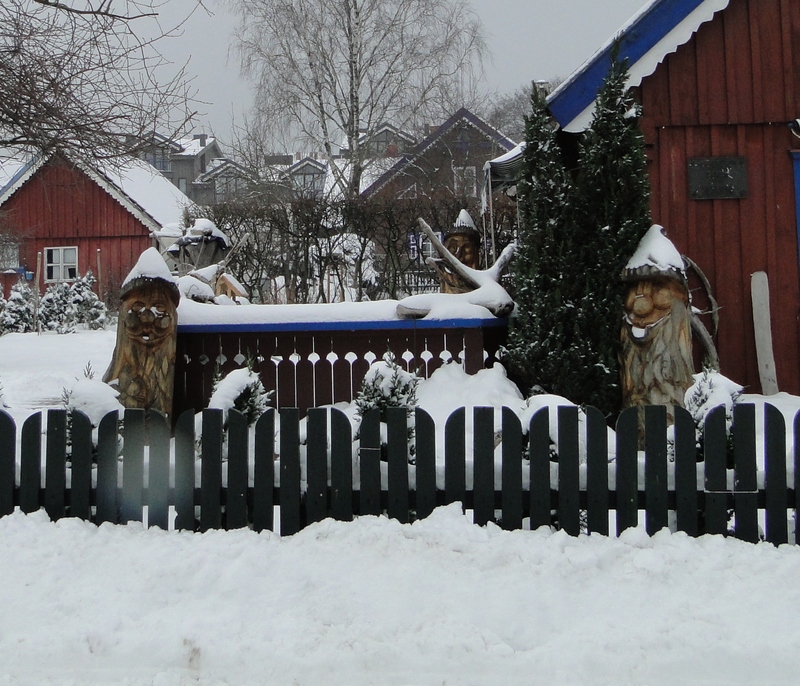 There were several of the wooden statues of the pagan gods and goddesses frequently seen here. 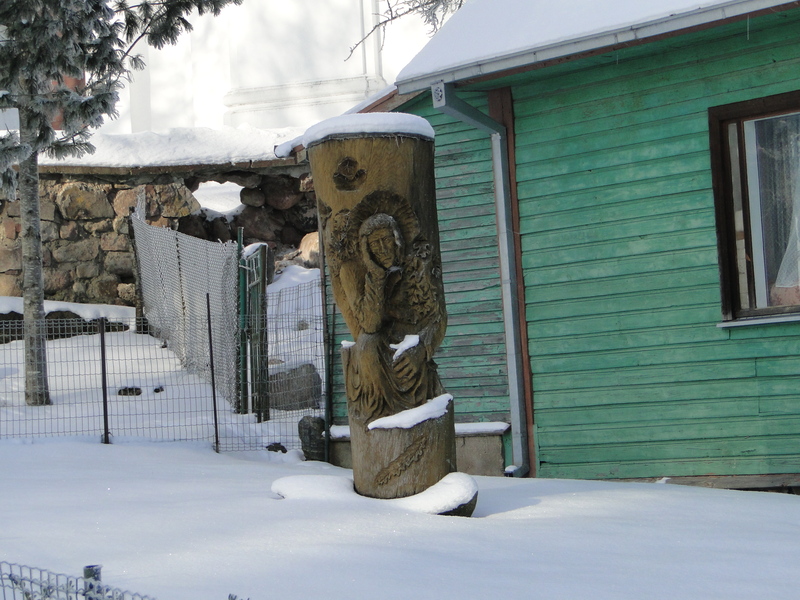 Lithuania was the last European country to be converted to Christianity but still it seems odd that habits of that pagan era remain–like putting pagan statues in your garden. 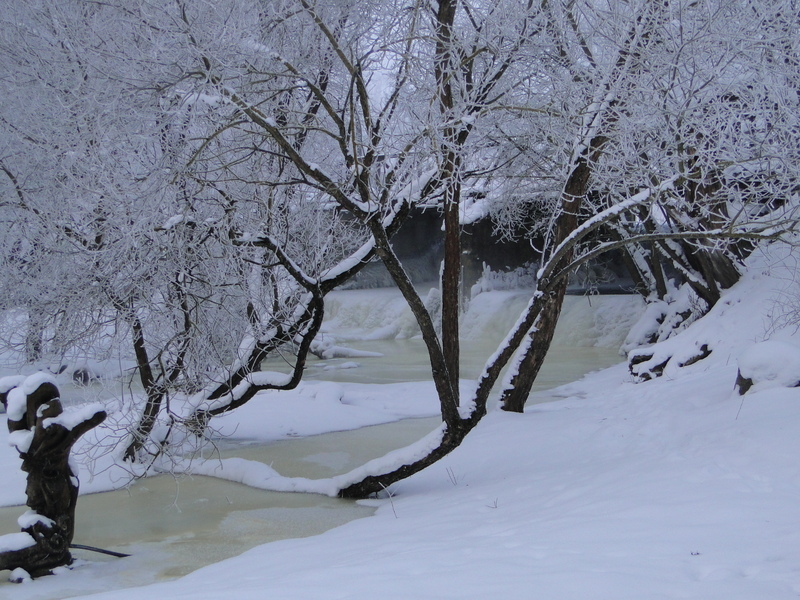 While we were outside taking the photos below, it was approximately minus 12 degrees Fahrenheit. 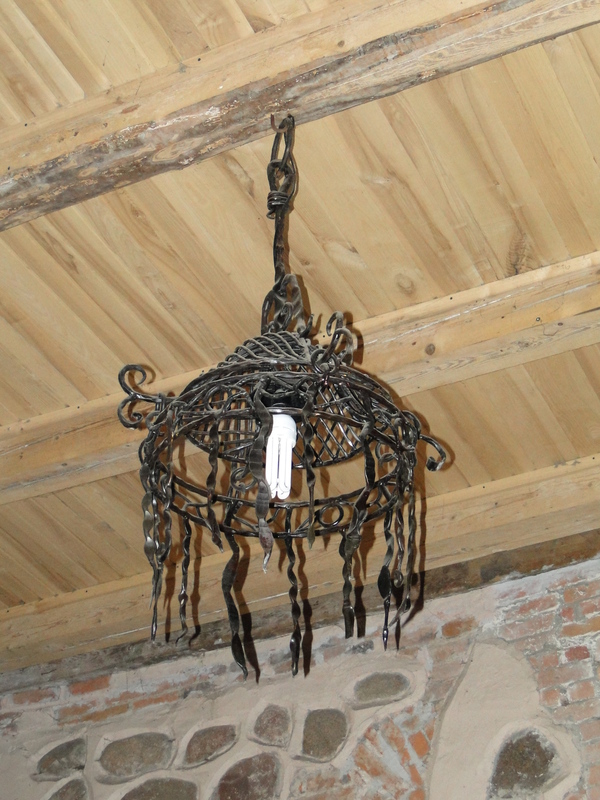 The owner of the mill has a friend who creates metal arts so there were many examples of his work–which was very interesting and different–both inside and outside. On Saturday, we drove about the countryside. 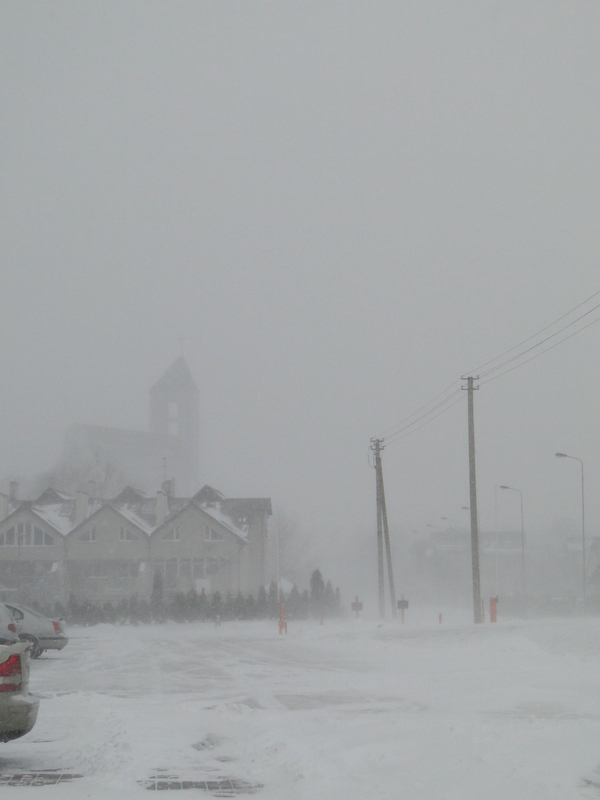 There wasn’t much to see except two 18th century churches and a lot of snow. The churches were fortunate survivors of many wars. 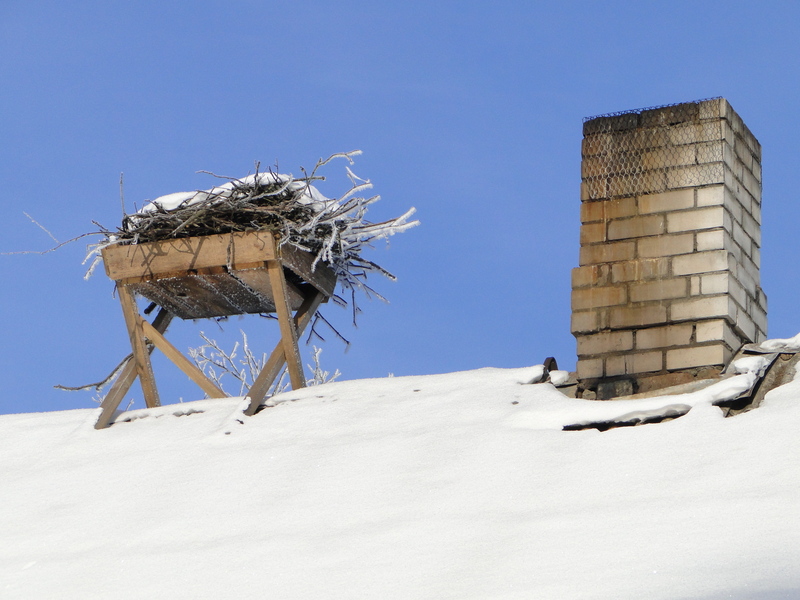 A platform for a stork nest was built on the roof of this building near the church. 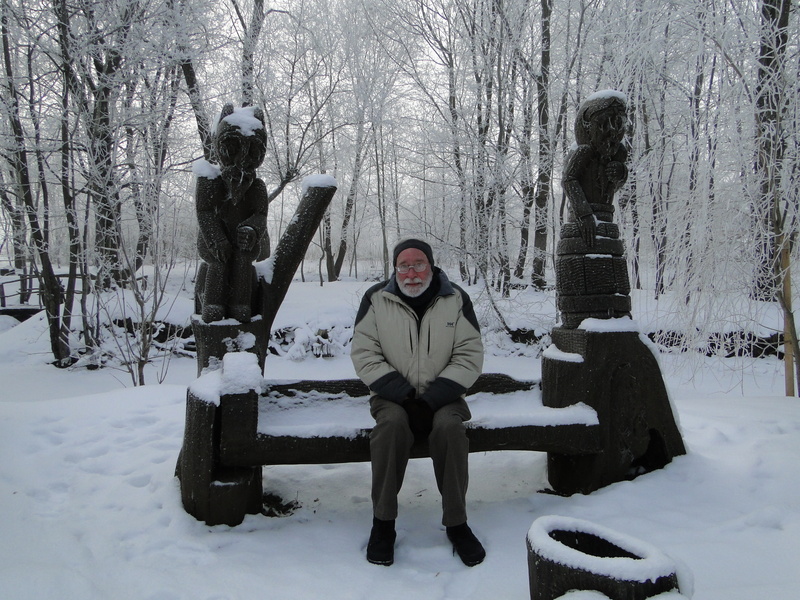 Oddly, this statue of Jesus looks very much like the pagan art--all carved in tree trunks. The last two days it has been considerably warmer here–all the way up to about 33 F right now–above freezing for the first time in more than two weeks. I’m hoping we’ve seen the last of the really cold weather. There is much we want to see and we just don’t get out and about much when it is zero and below. Here is a picture I took of an attractive, Russian perhaps?, woman at the grocery store last week. I love the outfit–she is a bit more dressed up than the typical Wal Mart customer. There are several stores here that have very fancy coats similar to this one. As most are so poor, I am surprised by the number of really up-scale clothing shops here in Klaipeda. By the way, I didn’t notice until I cropped this picture that it looks like there are old twin men in the background. I was trying to hurry so she wouldn’t see me taking her picture. It is now as cold as it looks in all the pictures. When we got up this a.m. it was -28C which is -18F. 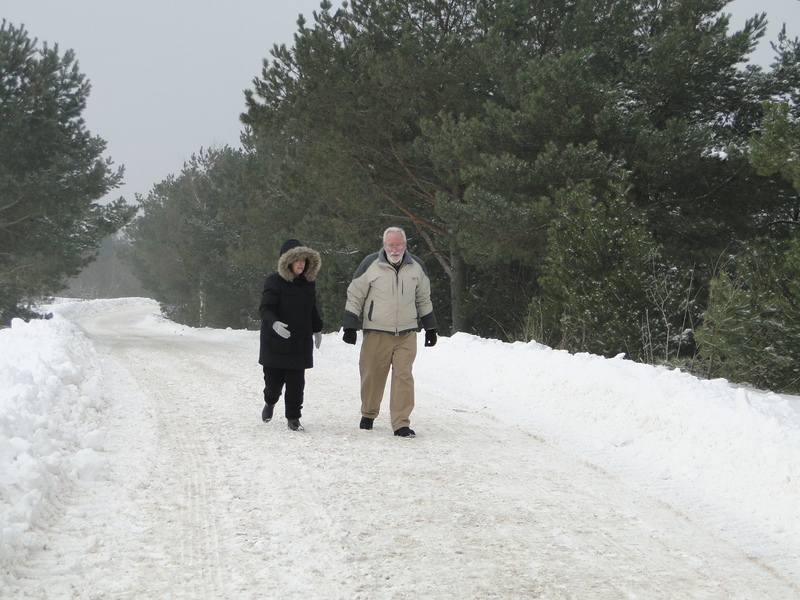 I am happy to report that it has now, at 2:45 p.m., climbed all the way up to -15C or 5 F. That is much better! John’s car wouldn’t start so we all (John, Rachel, Chayah, Noah, and two students, Dacia and Nastia, along with us) caught 2 cabs to City Church. It was great to see how many turned out on such a cold morning and as we drove past the bus stop there were a dozen plus students waiting out in the cold to go to church–an amazing sight.. In Orangeburg, some people can’t make it if it rains a little and I must say, if we had not had a ride, I would not have walked to the bus stop and waited in the cold. 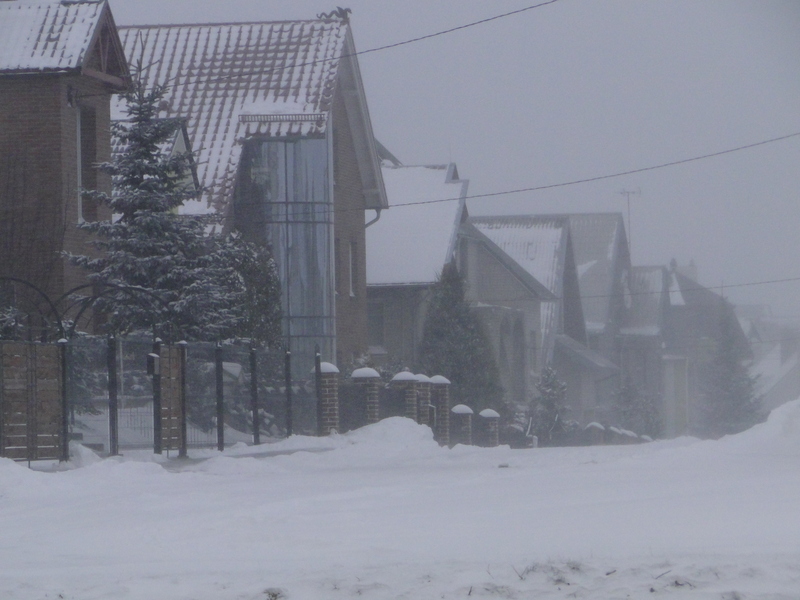 Though it is cold, and on Friday we had a blizzard–snow blowing everywhere so that everything was white–we still do not have a large accumulation of snow. Although the streets have not been plowed, it is still no problem for traffic to get through but it is a bit slippery as the snow is packed down. I believe it will begin to warm up on Tuesday–just a little. 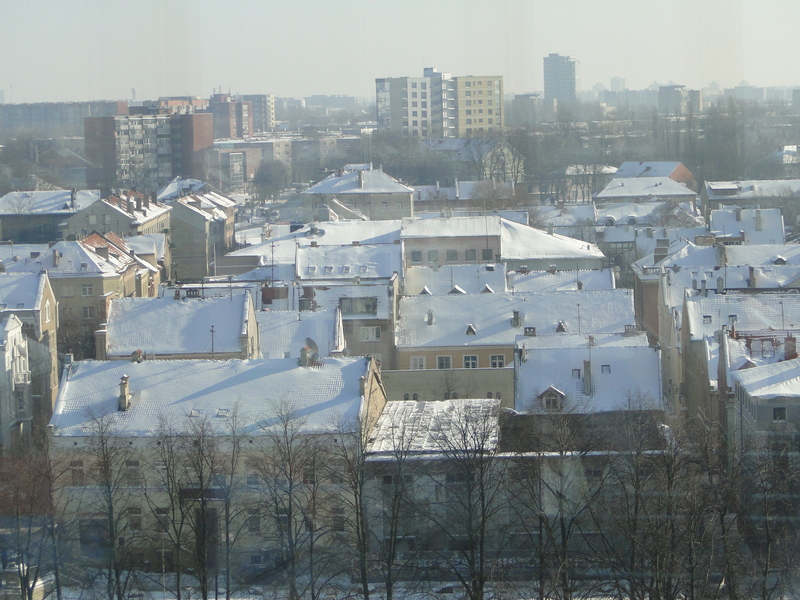 I understand that in the US, the groundhog saw his shadow on Feb. 2, which means there are six more weeks of winter–I don’t know if that is true for Lithuania as well but I’m expecting it will be at least six more weeks before we get any real break in the weather. By the way, Chuck and I were so pleased to find that the library had a copy of one of our very favorite movies, Goundhog Day, which we usually watch every Feb. 2nd. After watching it for maybe the 10th time, I decided this time that we really should go to Punxsutawney, PA, next year for Groundhog Day. But then, in some included comments about the movie, we learned that it was not shot there but in Woodstock, IL. What a disappointment! We can still go but it won’t be the same and, without Bill Murray and Andie McDowell, it probably wouldn’t be nearly as much fun. 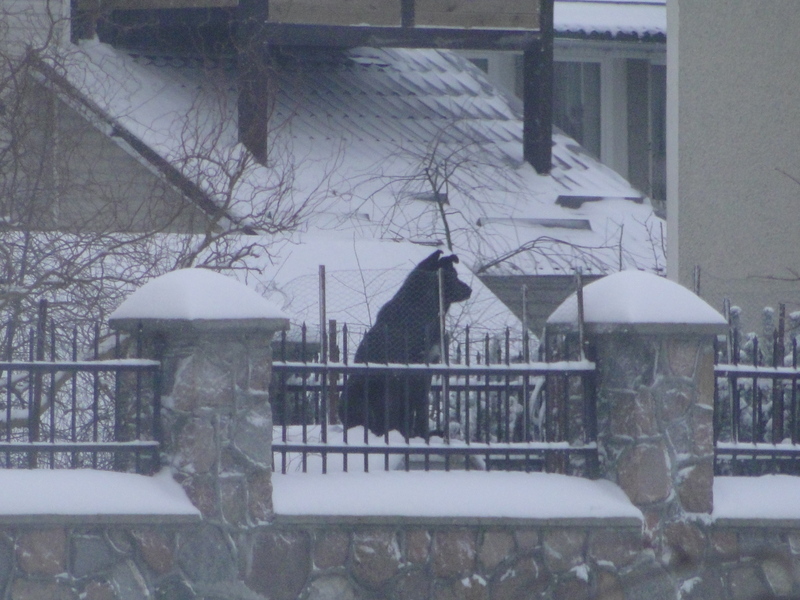 Here are some photos from Friday’s little blizzard and also a shot of my favorite neighborhood dog. He sits on his dog house like Snoopy. 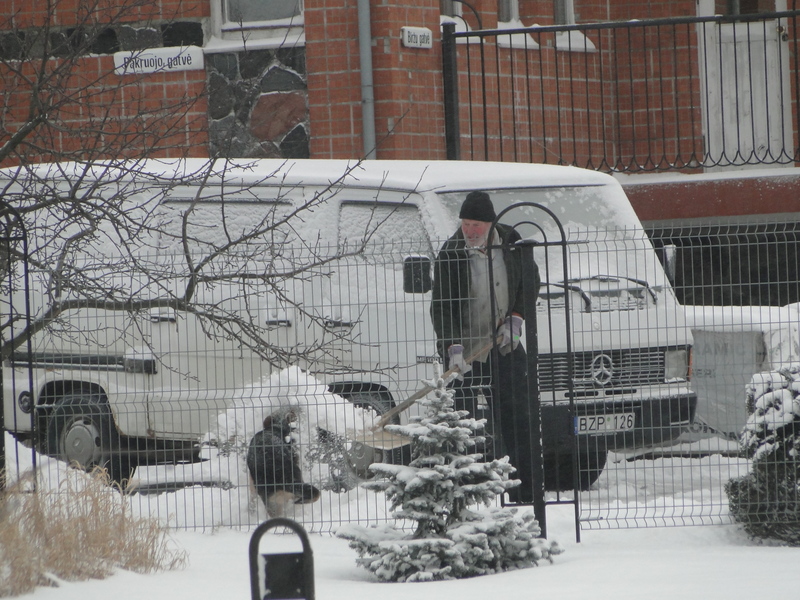 Neighbor plays with dog--this dog was loving the snow. 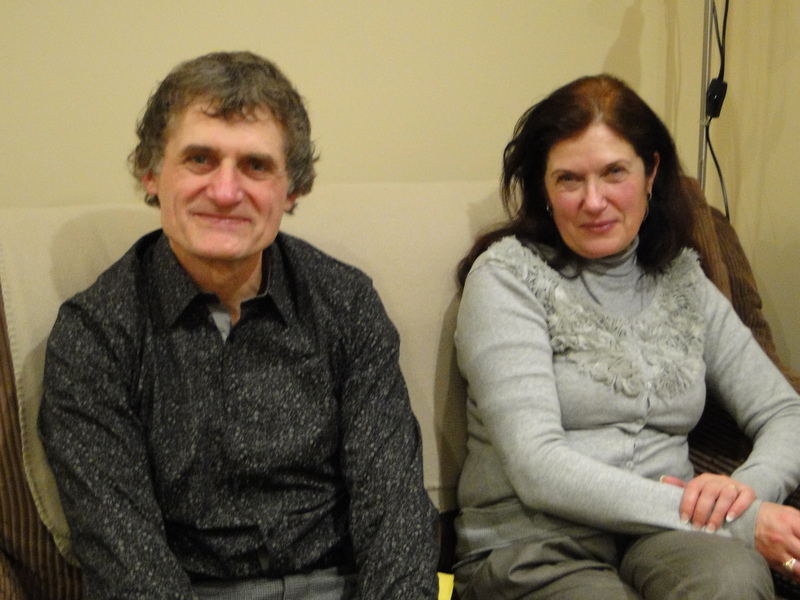 Our big event for this week was being invited to the home of Algis and his wife, Lianna, for dinner on Friday night. 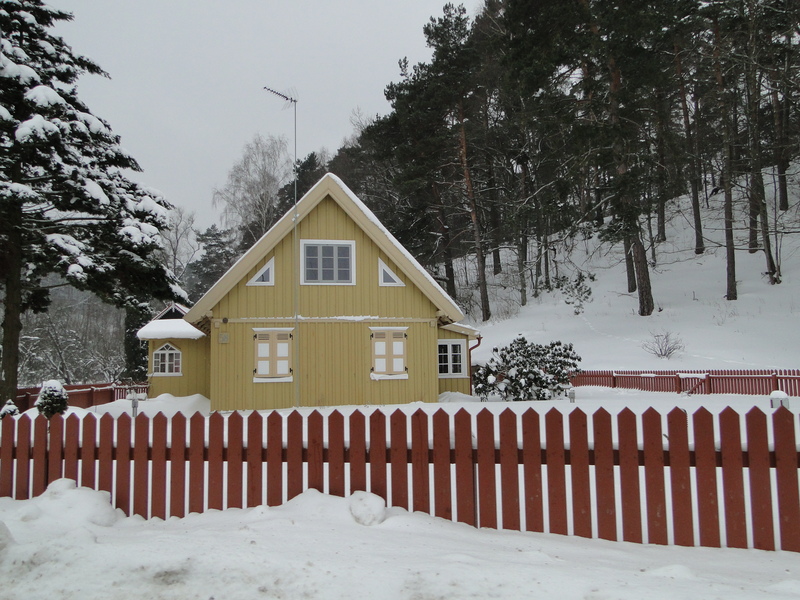 This is one time when I really wish I could have taken pictures to share with you because it was a very unusual house. Algis lives in a very nice up-scale neighborhood and his house is quite large and unique. It is surrounded by a yard with a small pond and has a decorative fence which is the norm in good neighborhoods here. Inside there were many floors with staircases going off in all directions. Some levels had just one room. The floors were all lovely wood–different types. There were marble floors in some places as well as the outside patio and porch area (where it made for very slick going in the snow). 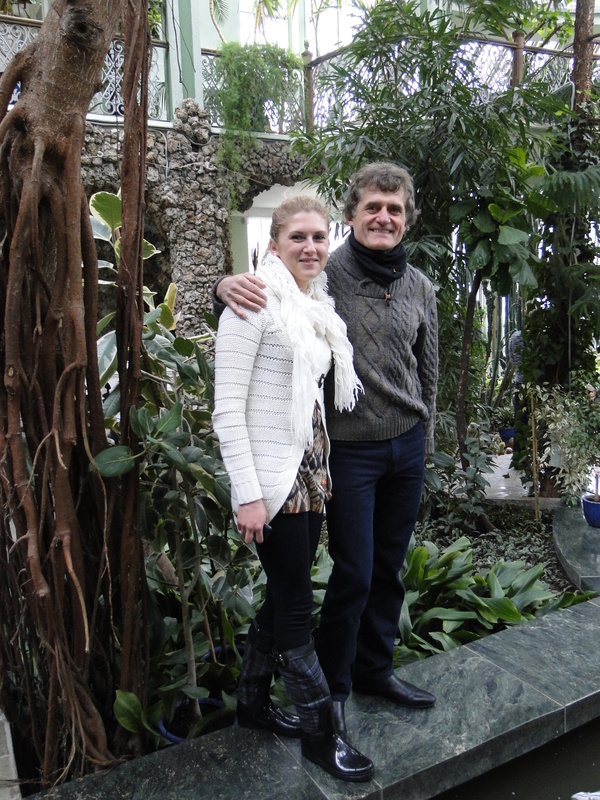 Their lovely and sweet daughter, Gabriella, who is studying to be a doctor, was also there. Dinner consisted of chicken cut into small pieces and cooked with peppers and celery in some sort of sauce, some slightly seasoned rice, shredded raw carrots with a dressing, and marinated beets which were chopped up with onions. The plates were prepared in the kitchen and served to us and no seconds were offered. No bread and butter were served and no salt and pepper were on the table. (I got full, and committed a serious Lithuanian faux pas – I didn’t clean up my plate.) I do not know if this is how it is always done in Lithuanian homes. Afterwards, we went to the living room downstairs for dessert in front of the fireplace. This was a huge course in itself and I was already full. There was a big selection of cheeses, some hot peppers and some garlic toes (they eat them plain) and some sort of meat. 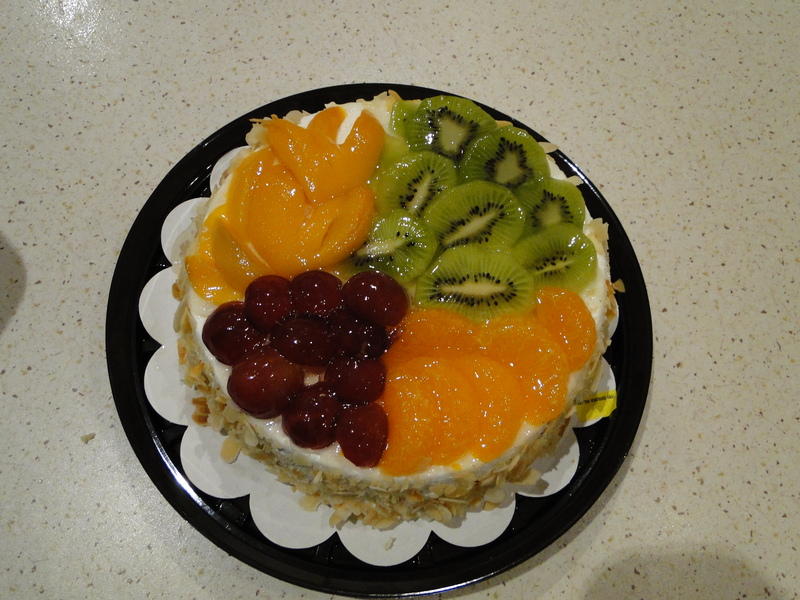 There was a huge dish of fruit–bananas, kiwi, grapes, etc. and a type of cake. Gabriella had made some cookies to add to all this. It was a very nice meal but a lot of food to eat. It was also pleasant company although Lianna does not speak English so I’m sure it was boring for her. Though it is Sunday afternoon, Chuck is in his office grading papers. He is very over-loaded with so many students. We will have a little break this week as we will be taking off on Friday and Saturday for a short sight-seeing jaunt with some other folks from the university so we are looking forward to that and I should have some interesting things to report.